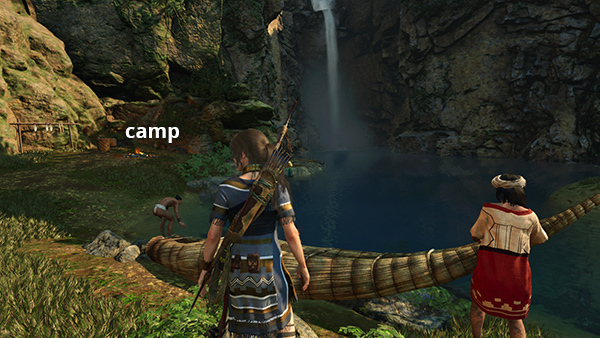 *Starred camps are outside the city proper and are not counted in the total on the in-game map. There are also several camps in the upper city and outlying areas, which will be covered in the next section. NOTE: This level is BIG so I'm breaking it up into three sections: the Lower City, the Upper City, and Hidden City Revisit. There are certain areas, missions, etc., you can't finish until you return to this level later in the game. 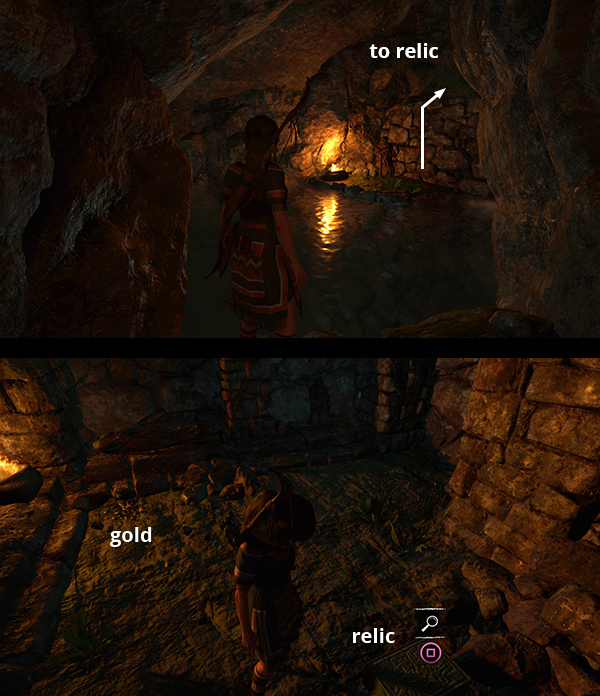 The challenge tomb and crypt in the side area to the west is accessible, but I have included them in the HIDDEN CITY REVISIT walkthrough to minimize backtracking. The item totals above are for this section only. 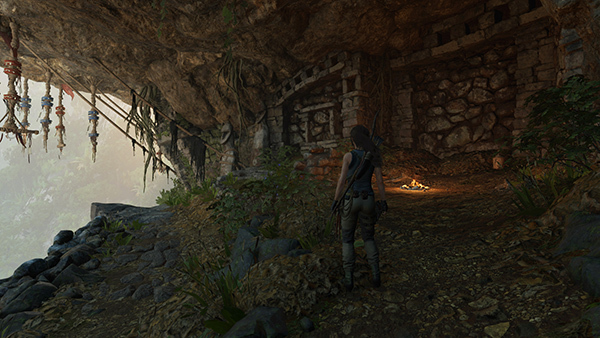 As Lara emerges on the cliffside after completing the Trial of the Eagle, she's able to speak with Jonah briefly before he enters a cavern and the signal breaks up. CIFFSIDE LEDGE AND BASE CAMP: Gather a few resources here and "discover" the Quipu Overlook Base Camp since you may want to return here later. 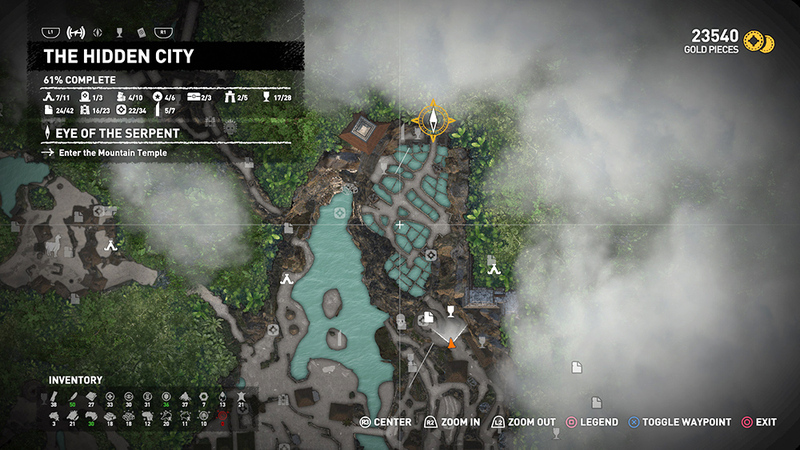 (screenshot) The in-game map is still calling this "Location Unknown," but later it will be shown on the map as part of the Hidden City. When you're ready, move out onto the pointed rock that juts out toward the nearest of the dangling quipu. 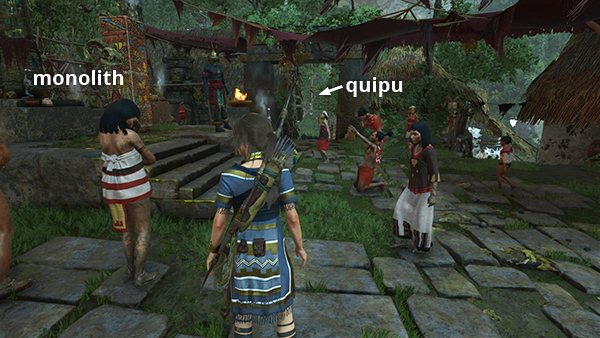 Jump out toward it and press Interact/Grapple to grapple the quipu. 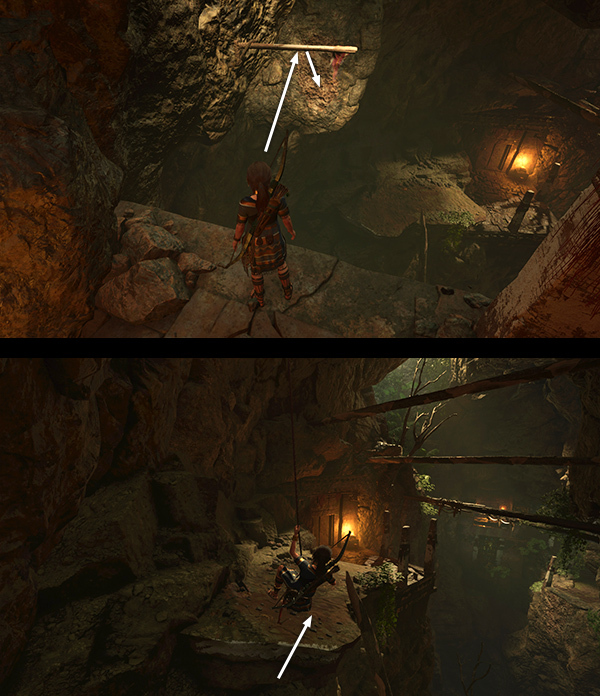 (screenshot) Swing forward, press Jump to release the cable, then Interact to grapple the next quipu, then the third, and the fourth. 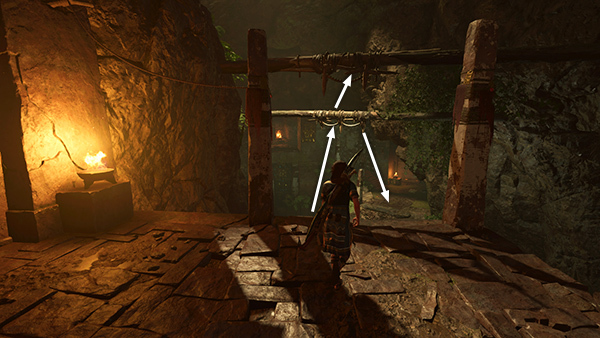 As you swing forward after grappling the fourth one, jump and grab the ledge ahead. It may take a little trial and error, but you'll get a feel for it. The trick is not to try and swing back and forth while hanging, just maintain forward momentum. POOL AND PATH THROUGH THE FOREST: Move through the tunnel to a wooden ledge overlooking a pool. The game prompts you to swan dive. Jump forward then quickly press C on the keyboard, Circle/B on the controller to dive. A successful swan dive initiates the High Diving Challenge. 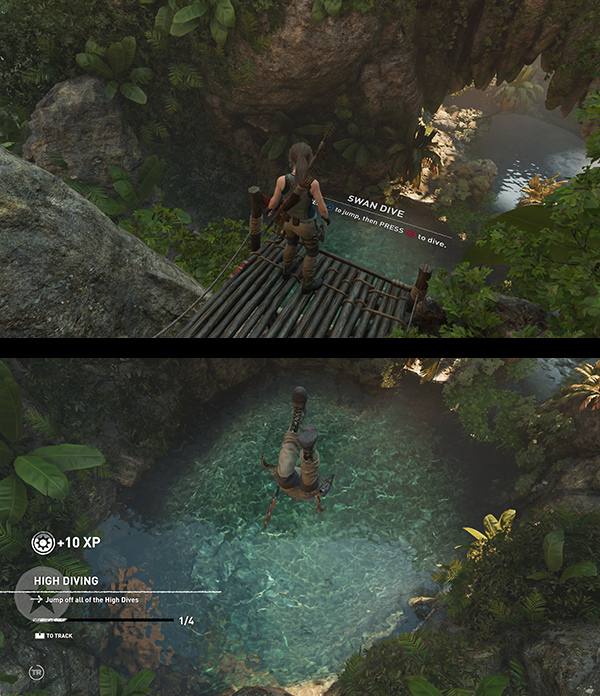 (screenshot) Execute 3 more dives off similar wooden platforms to complete it. Don't worry if you miss this first dive. You can reload the checkpoint and try again if it's convenient, but there will be other opportunities. 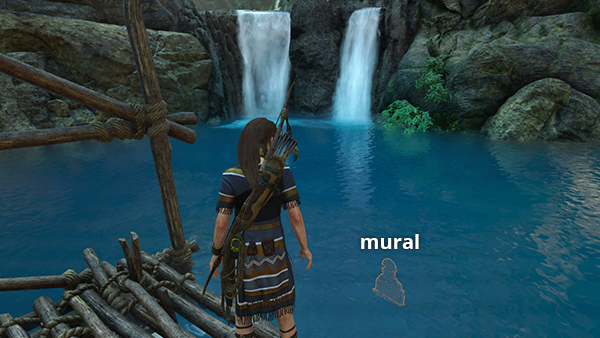 Gather a few resources in the pool, including some gold ore embedded in the north wall of the first pool, and a supply canister and jade ore on the south wall of the second pool with the waterfall. Then climb out and follow the path to the northeast. As you duck under a tree that has fallen across the path and enter a clearing strewn with skeletons, Lara again tries to contact Jonah. She says she thinks she's found the Hidden City and is going to look for the serpent with the silver eye. ABANDONED VILLAGE: Start up the path with the stone steps, ahead on the left. 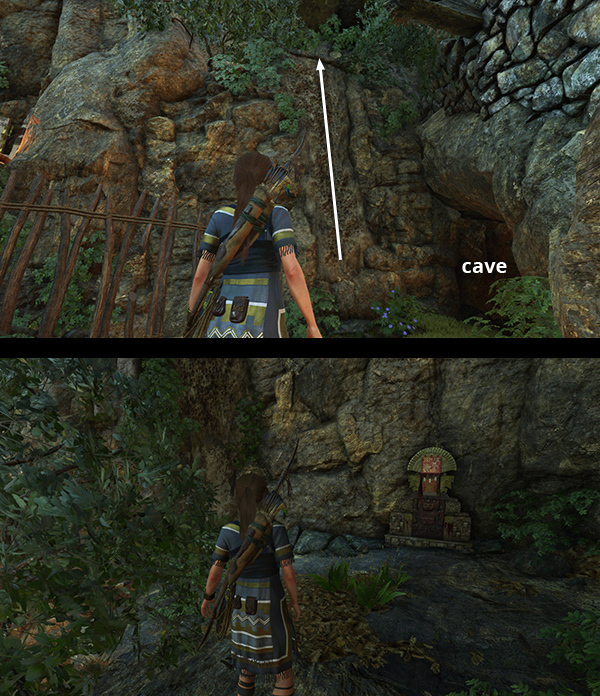 (screenshot) Continue up another flight of steps and under a stone archway. The first document (1/42), Fawcett's Legacy (Search for the Hidden City), is lying on the ground just to the right of the next flight of stairs leading up to the east. 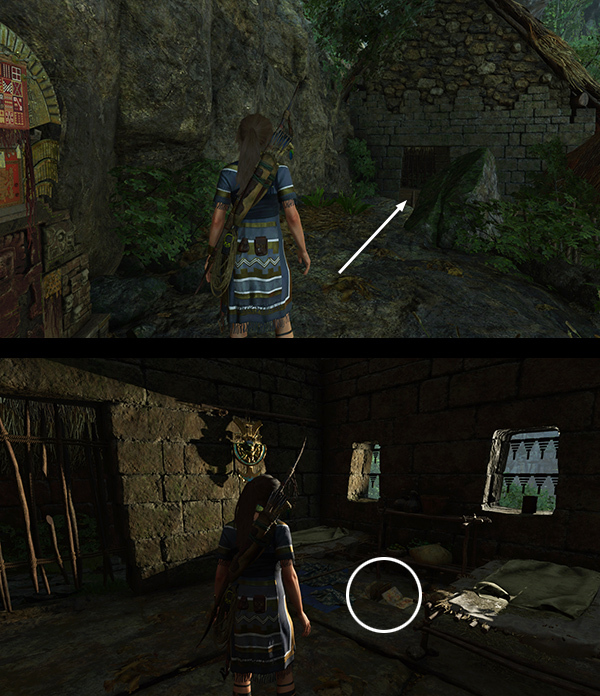 (screenshot) Lara can also cut down the animal hide in the wooden frame next to the document to add it to inventory. 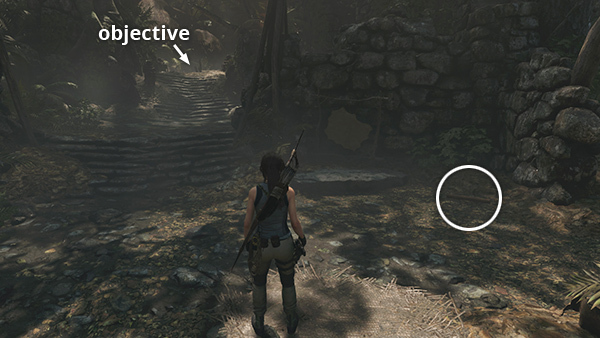 As you're doing this, Lara hears someone struggling nearby. 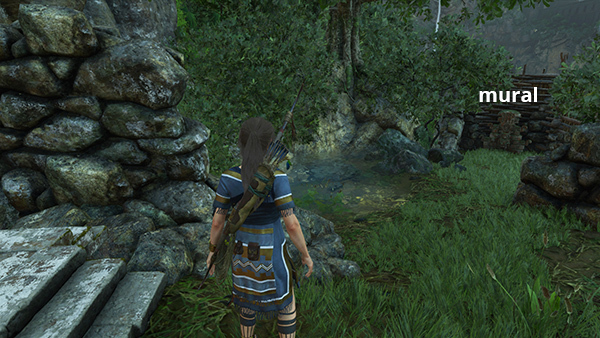 At this point, you can choose whether to explore this area more thoroughly or follow the story. If you head for the top of the stairs you'll be whisked along to the Hidden City and won't be able to return here for a while. 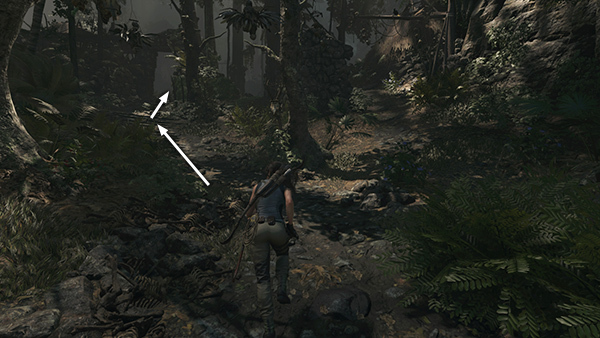 There's no right or wrong answer here, but you will need to return to this area anyway, while doing a Side Mission. 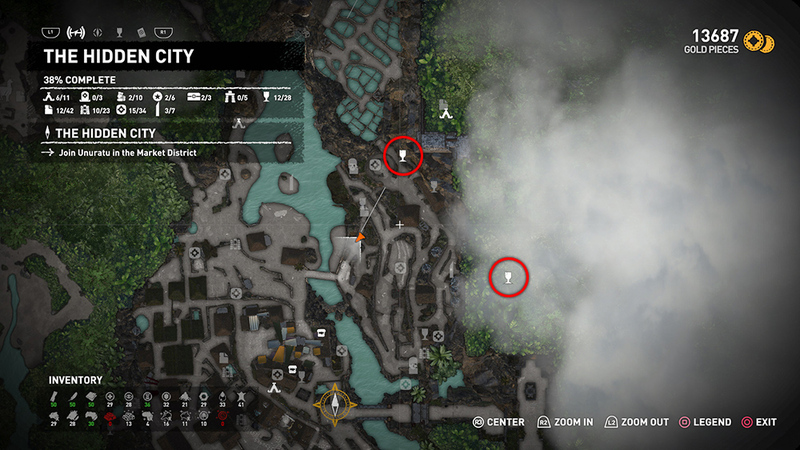 Also, there are a number of collectibles you can't reach yet because you don't have the right gear. I recommend taking a brief detour to grab some gold and other resources. There's hardwood and various herbs, as well as birds, rabbits, and wild llamas you can hunt if you feel so inclined. 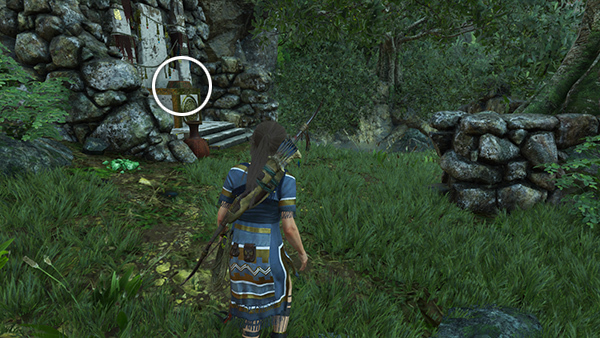 About halfway along the south side of the village is a door with a rope coil. Use a rope arrow to pull it down. 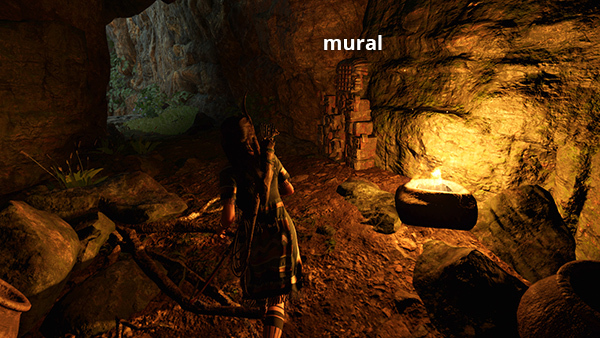 Inside you'll find 2 piles of gold ore and a container of black powder, which you can use to craft explosives. 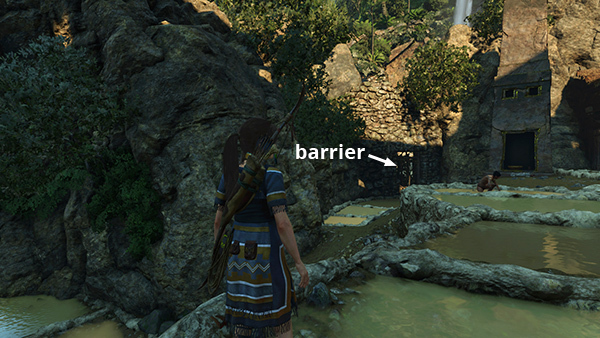 (screenshot) The second barrier, to the left of that one, that can only be pulled down with the ROPE ASCENDER, which you don't have yet. 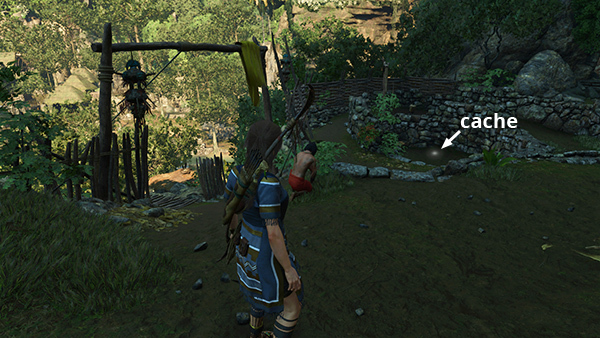 There are also a few climbable trees that will allow you to reach resources on branches, ledges, and rooftops, and the stone house opposite the one where you found the gold contains a resource canister. 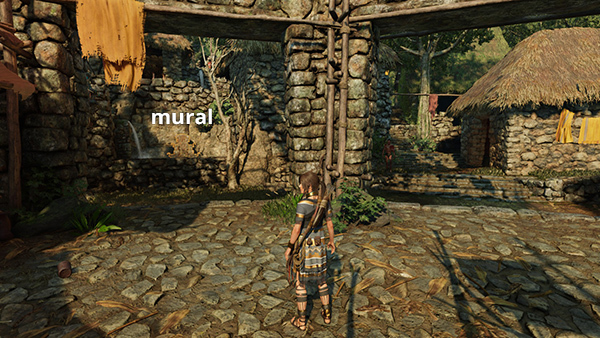 The rest of this area, including the pool to the northwest and the nearby WOLF DEN and a CRYPT, are covered later in this walkthrough. 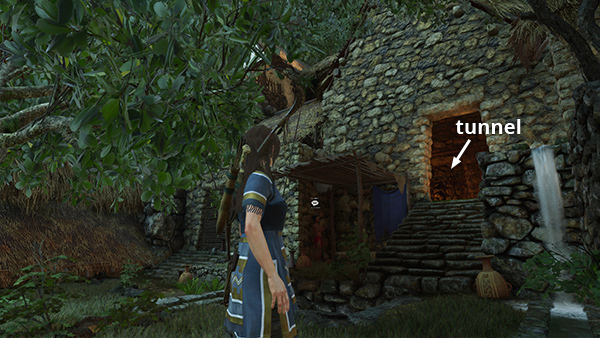 Climb the stairs to the east to trigger a cutscene. This is a long one so I won't describe the whole thing. 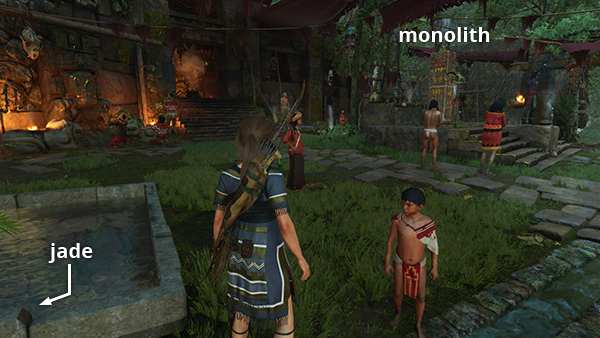 The short version is Lara saves the life of a boy who turns out to be the son of one of the Hidden City's leaders. 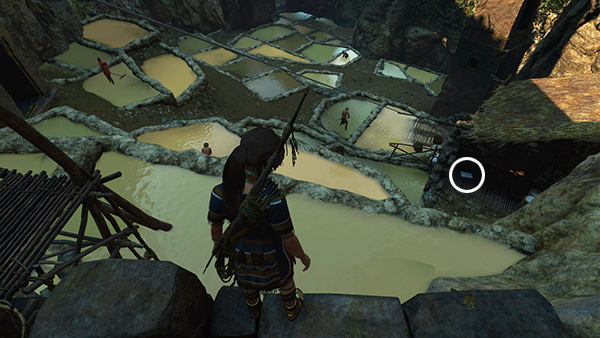 The city, called Paititi by the locals, is the place Lara has been seeking, and the woman knows the location of the mysterious "serpent with the silver eye." The cult whose members attacked the boy, is somehow linked to Trinity, and since they share this common enemy, the woman agrees to help Lara find the Silver Box in order to keep it out of Trinity's hands. To ensure that Lara sticks to the plan, they will be holding Jonah hostage. 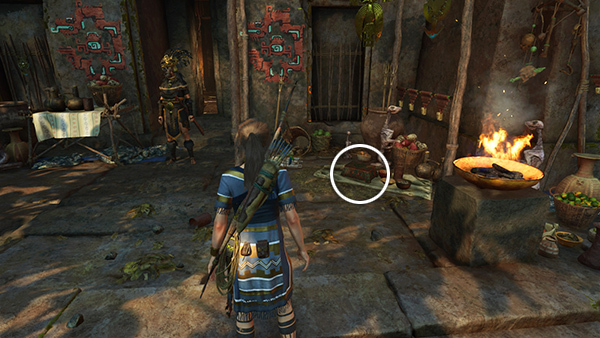 After the last cutscene, a photograph, The Cult of Kukulkan, is added to the Artifacts menu, in the Lara's Notebook Story. Examine it to learn more about the mysterious men in green. If you're going for 100% completion, there's lots to do here. You'll also want to sell resources and buy supplies before moving on. 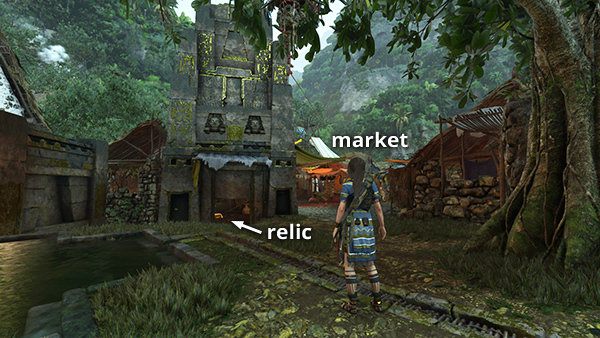 There are notes about the MARKET and a TRAVELING MERCHANT below. At this point, you also unlock The Forge DLC Side Mission back in KUWAQ YAKU, provided you have purchased and installed that expansion pack. 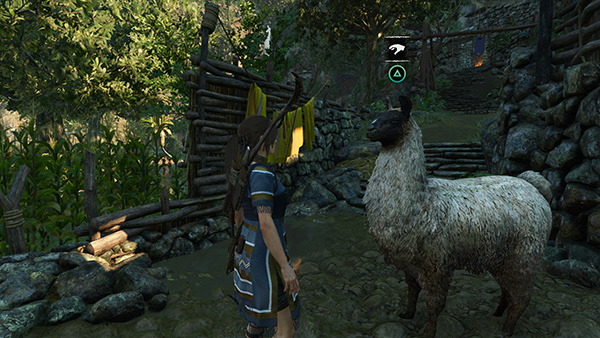 Before crossing the bridge, take a moment to pet the llama, like Etzli did. (screenshot) If you pet 5 llamas you'll unlock the Como Te Llama achievement/trophy. 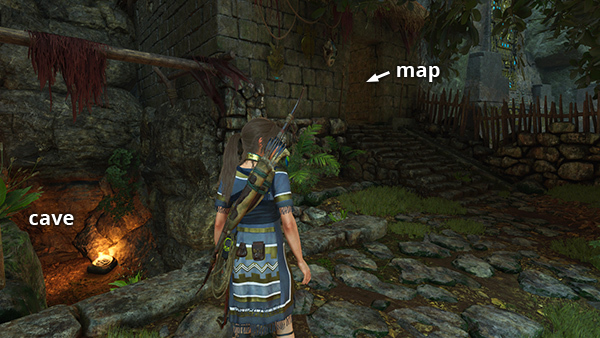 Other llamas are marked with yellow dots on the annotated level map. Since Side Missions are optional and fairly lengthy, the details are included in a separate DICE WITH THE DEAD MISSION WALKTHROUGH. 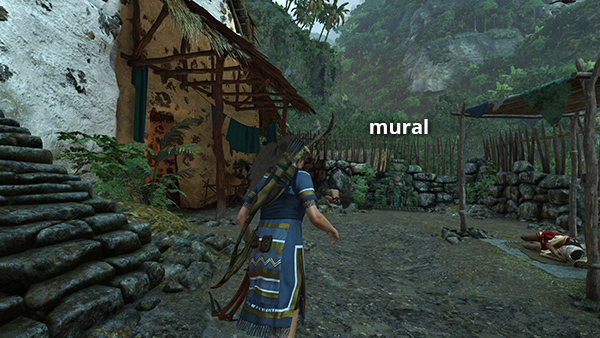 Even if you're not after 100% completion, I recommend doing this mission since it will introduce you to the politics of Paititi and reveal a few special items/areas. It will also introduce you to an important merchant. Note that DICE WITH THE DEAD actually involves 2 separate sub-missions: Find Takiy's Dice and Seek Out the Outcasts. So when you finish, 2 completed missions will be marked on your map. Completing the missions also earns XP and 250 gold pieces, though I'm not sure where a little kid like Takiy would have gotten all that money. 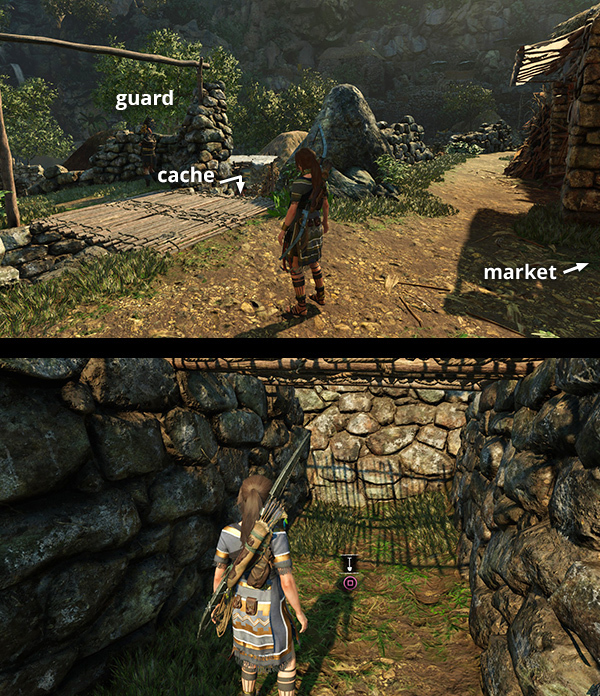 NOTES: If you're not sure which items to buy, and you are going for 100% completion, I recommend buying the ASCENDER and LOCK PICK from Moraekah, and the KNIFE UPGRADE from the woman in the marketplace as soon as possible. These will enable you to unlock treasure chests and access most areas blocked by barriers. You'll also need a SHOTGUN for some barriers, but you'll get one in the course of the story. Next, go for the HUNTER'S QUIVER and SATCHEL. 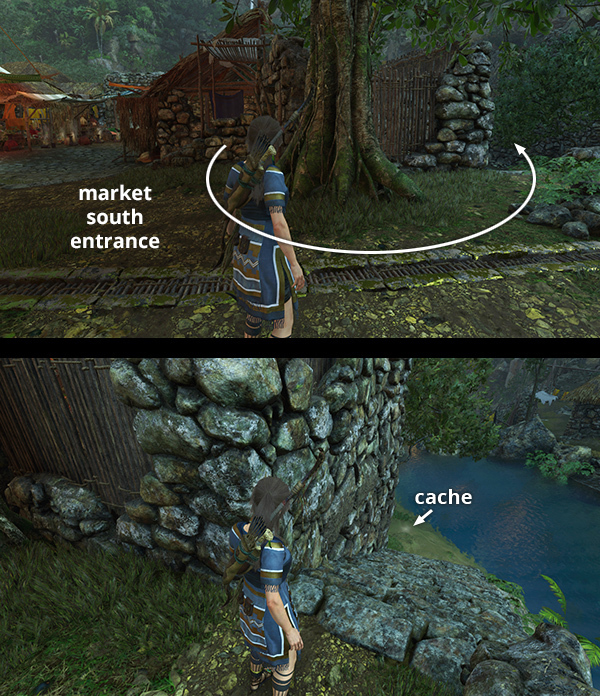 The satchel will allow you to collect more resources, which you can use or sell for gold. You'll eventually have more gold than you can spend, but these items are good early choices. BUG NOTE: Some Xbox One players have had issues with 100% completion due to a bug, which has apparently been fixed in Update 3 (released 10/3/18). If you have not patched your game, I recommend doing that a.s.a.p. If you can't patch for some reason, you may want to avoid buying all but essential equipment (e.g., satchels and pouches, and later the rope ascender, lock pick, knife upgrade). See this thread on the LCO Forum for details. 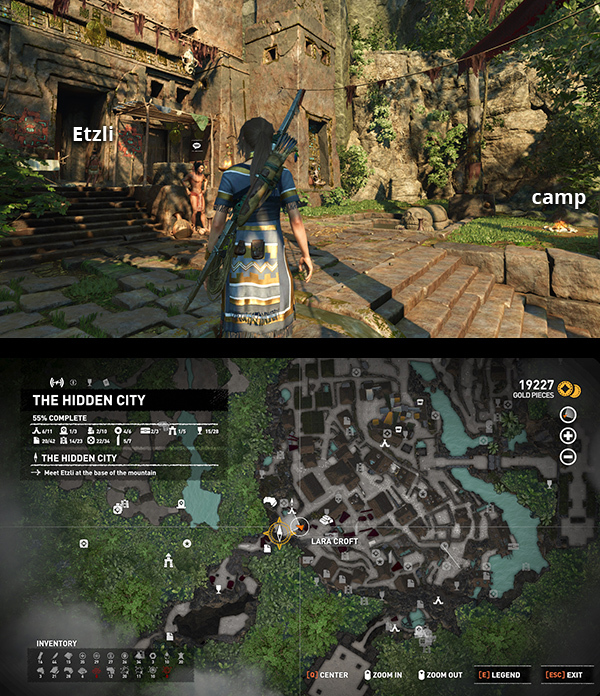 HIDDEN CITY CHALLENGES and the TEMPLE OF THE SUN CHALLENGE TOMB are covered below the collectibles lists. The ABANDONED VILLAGE and CRYPT to the northwest of the city, are also included here. The CRYPT and PATH OF BATTLE CHALLENGE TOMB west of the city will be covered later. 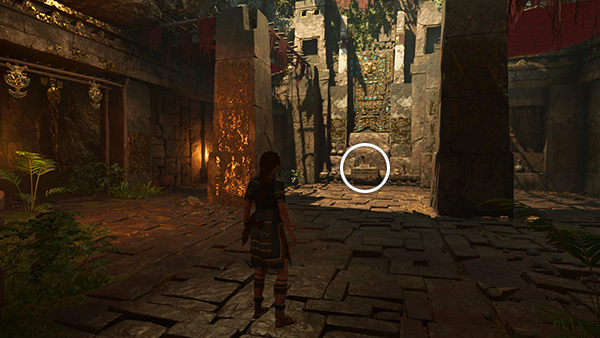 If you gather all the major collectibles in the LOWER CITY and complete the TEMPLE OF THE SUN CHALLENGE TOMB, you should have several Skill Points to spend before you even start the next part of the story. As always, choose the skills that suit your play style, but if you need recommendations, I would suggest Raposa's Wit (Warrior), which unlocks the next tier of weapon upgrades. You can then use the resources you'll gather around Paititi to upgrade the weapons you have. 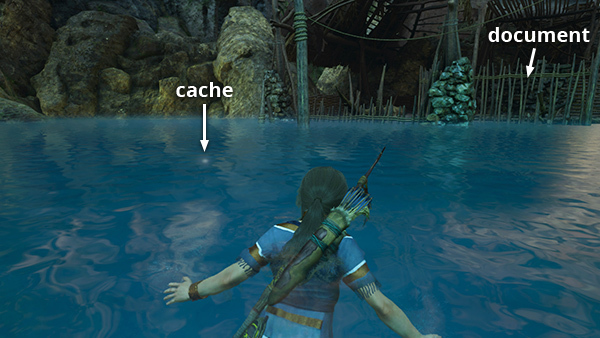 Caiman's Breath (Scavenger), which helps Lara hold her breath longer underwater. Puma's Feint (Warrior) is not absolutely necessary, but if you used the Dodge Counter and Dodge Kill skills in the previous games, this is the same thing. It will be especially useful in one of the upcoming levels. If you're attempting to unlock all the achievements/trophies, you should also unlock Serpent's Strike and Serpent's Fury (Scavenger) by the middle of the game so you can use the latter to unlock the Chain Gang achievement/trophy. We'll cover that in upcoming combat sections. Relic (3/28) Burial Mask (Mam/Metamorphosis) - To find this relic and the hidden gold marked on your map during the Dice with the Dead Side Mission, locate the explorer backpack (above). Then climb onto the ledge above the pack and follow the tunnel to a small room. The relic and gold are here. 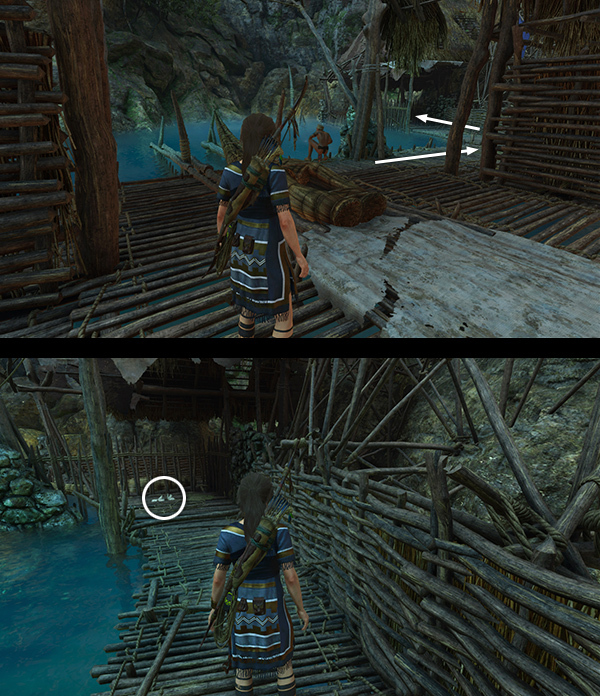 (screenshots) Exit the way you came or use a rope arrow to pull down the wooden ceiling and climb out. 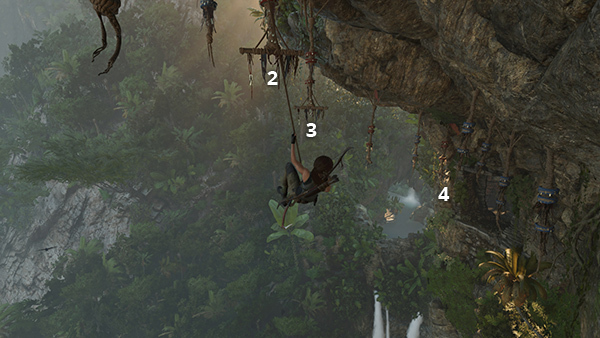 The condor's nest that one of the outcasts mentioned in the Dice with the Dead Mission is at the top of the climbing wall near the base camp. (screenshot) Looting the nest is part of the Keep Calm And Carrion Challenge, covered below under Challenges. Mural (3/23) Silver-Crowned Mountain (Mam/Metamorphosis), is just northeast of relic #5. (screenshot) When you have everything up on this ledge, climb back down to the Temple District Base Camp the way you came. Head for the Fluent Yucatec monolith (5/7), due east of the temple entrance. 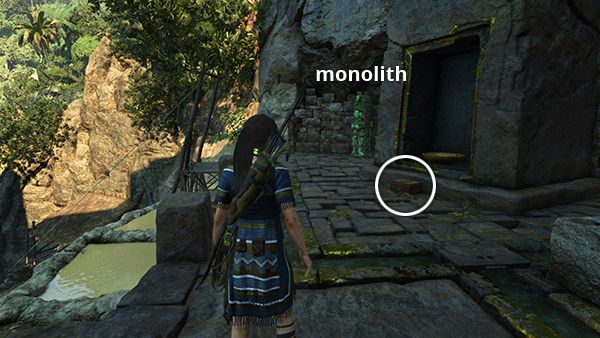 When you first enter this area, you probably can't read the monolith yet, but when you do it will reveal a clue leading to a buried survival cache (22/34). This may come a bit earlier or later for you. Follow this link for details and screenshots. Above the street that runs away from the monolith to the northwest is a dangling quipu (1/3) you can grapple for the Dropping Decimals Challenge. (screenshot) For additional details, see Challenges, below. Document (3/42) Rebirth and Resettlement (Quechua/Founding Paititi) - In the same cave as relic #6. 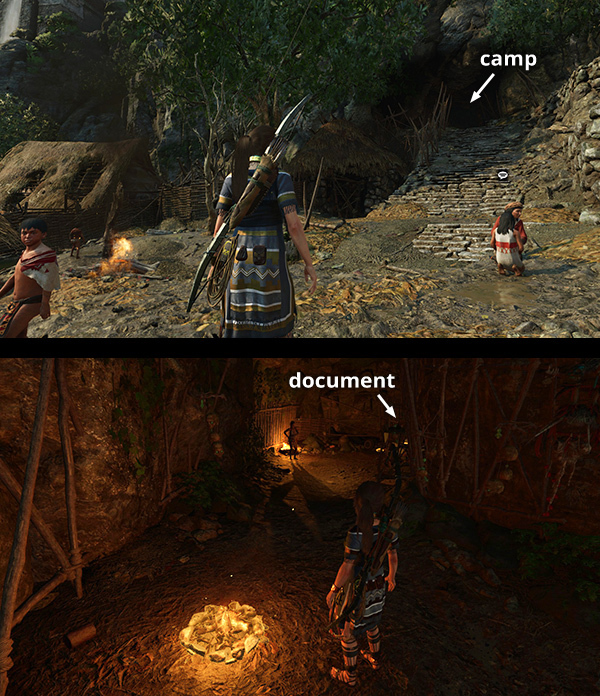 (screenshot) There's also a small pile of gold ore near the document. Relic (8/28) Ceremonial Torch (Yucatec/Secrets and Lies) - To the left of mural #6 is another tall climbing wall. Climb up and around to the left, then jump and latch onto another section of climbable wall to the left. Rappel down to land in front of a little shrine with the relic. (screenshots) If you like, you can continue to the left to explore the TEMPLE OF THE SUN CHALLENGE TOMB, covered in detail below. Or jump down to the stairs and continue exploring the city. There's no hard demarcation between Paititi's various neighborhoods. I'm just breaking things up so that hopefully it will be easier to find each item. 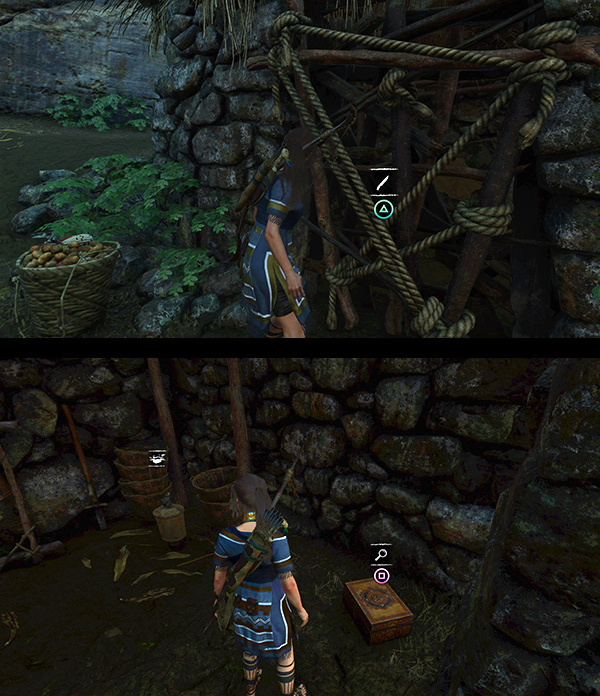 There's a treasure chest (2/3) beneath the eastern corner of the dock, (screenshot) but you can't reach it from there. You'll also need the LOCK PICK (above) to open it. After digging up survival cache #6, near the end of the dock, surface for air. 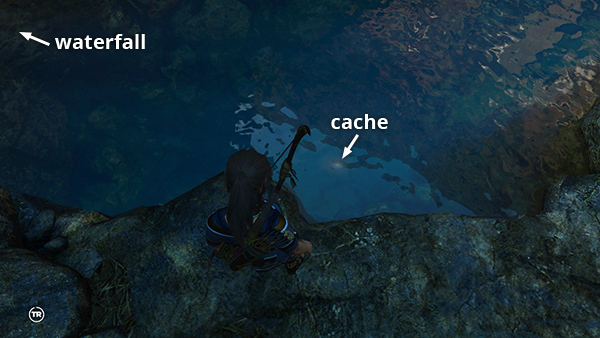 Then dive back down to where the cache was. 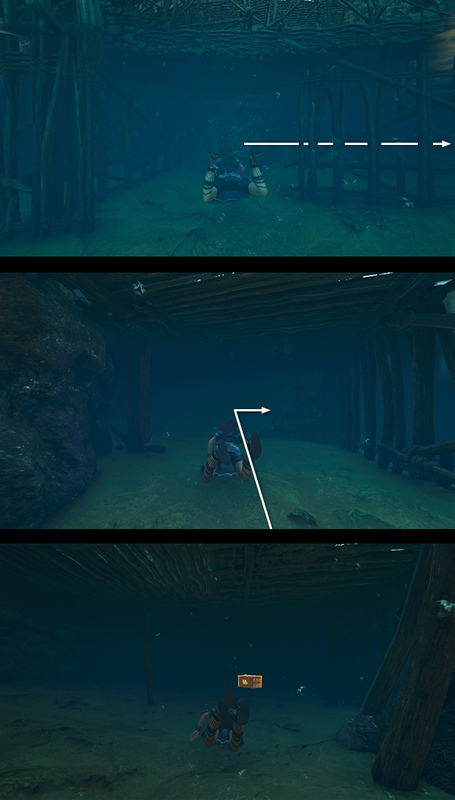 Turn right and swim under the dock to reach the chest. 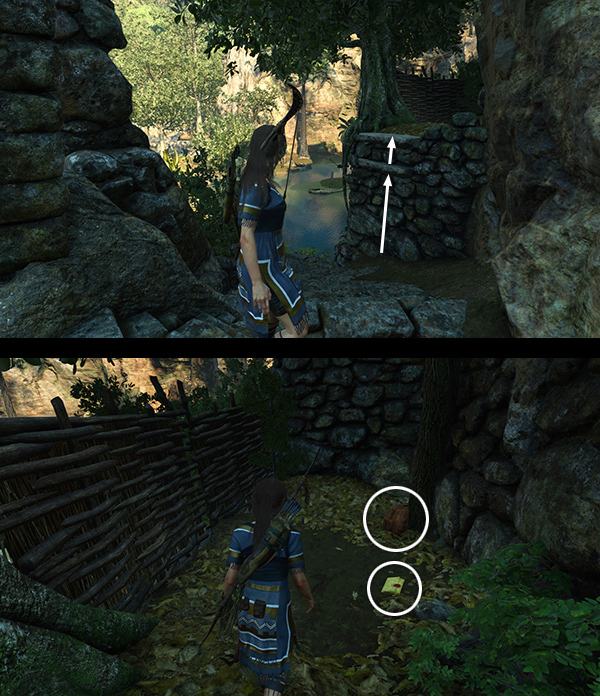 (screenshots) Swim near it and hold Interact to open it with the LOCK PICK. Inside is an Artifact, a Ceremonial Fire Drill (Yucatec/Cult of Kukulkan). Swim back out the way you came. The area north of the Paititi Market and west of the river is a mostly open area devoted to farms and fishing. There are still a few pick-ups to be had. Due west of the footbridge is the entrance to the PATH OF BATTLE, a side area containing a Crypt and Challenge Tomb. 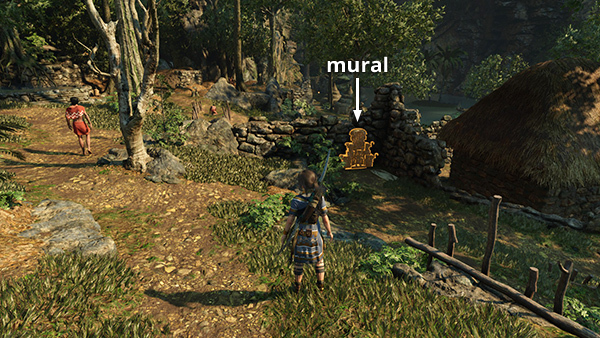 (It's shown in this screenshot and marked on the annotated level map.) One of the later Side Missions takes you into that area, so I have combined all three in the HIDDEN CITY REVISIT walkthrough. If you want to explore that area early, go ahead. 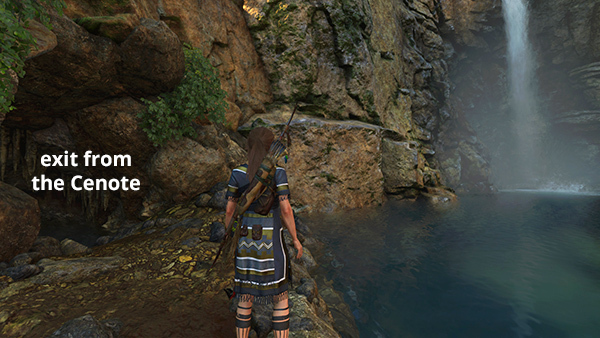 Document (8/42) The First Emperor (Quechua/Founding Paititi) - You'll pass by this document later during one of the Side Missions, but if you want to get it now, climb the tree near the Fishing District Base Camp and jump to grab a handhold on the rock wall. Climb onto the ledge above, turn left, and jump over to another set of handholds. 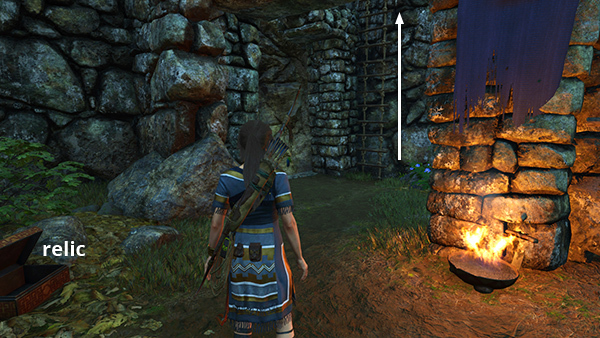 Climb to the ledge above on the left to find a condor's nest, which you can loot for feathers and/or the Keep Calm and Carrion Challenge. Use the horizontal branch to swing over to a handhold on the wall beyond. Then scramble up onto the ledge to find the document. 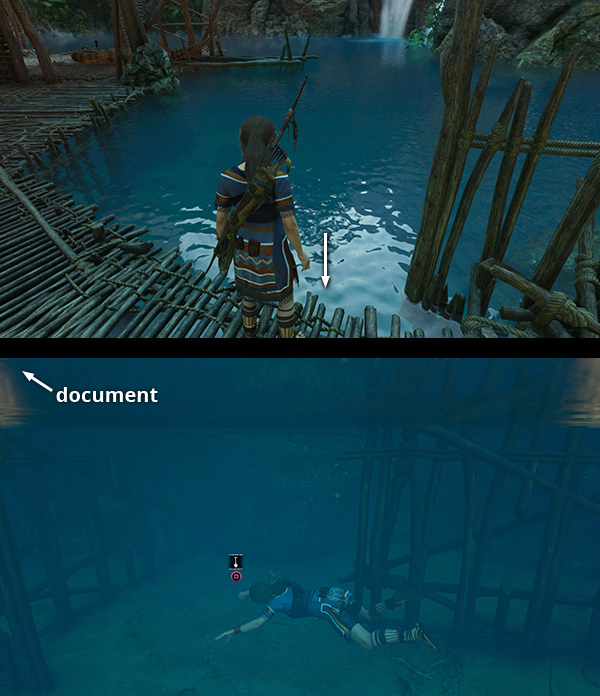 (screenshots) The tunnel leads to an area you can't access yet, so dive into the water to get back down. 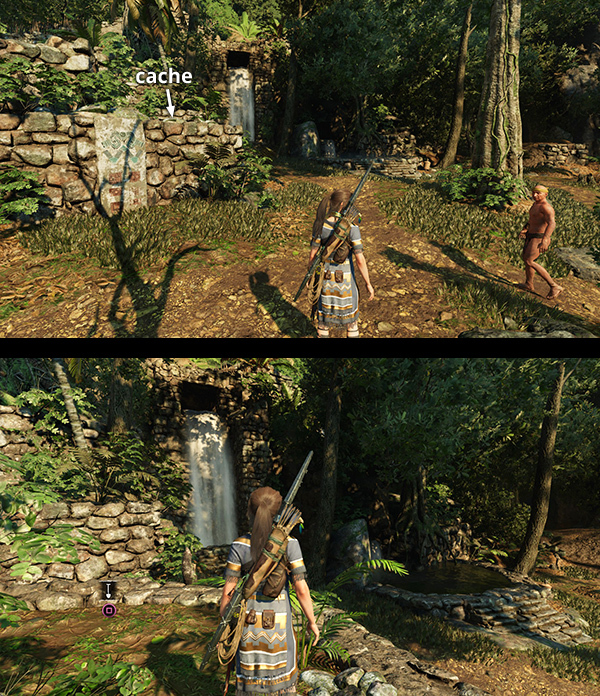 Survival cache #11 (the monolith riches mentioned above) and the jade ore marked on your map by one of the outcasts during the Dice with the Dead Mission can both be found beneath the waterfall. 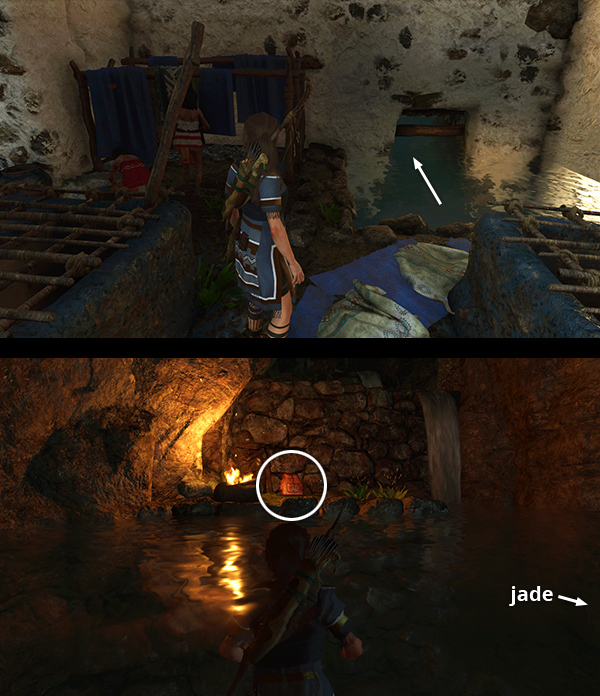 There's also more jade ore on a little ledge behind the falls. 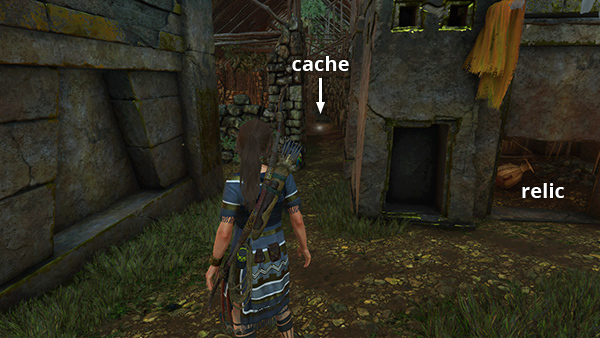 (screenshots) As with all monolith riches, this cache only appears once you have actually deciphered the monolith. If you want to keep exploring the city, swim southward, away from the waterfall and climb out of the water on the stone steps on the left (east) bank. 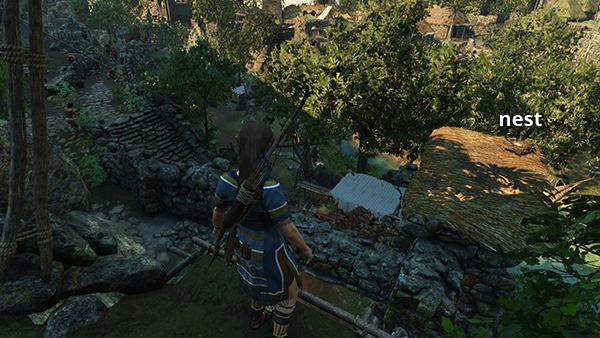 (screenshot) There are other places you can climb out of the water, and the bridge you crossed earlier links east and west sides of the city, but the list below begins with the northeastern section. Relic (10/28) Chaki Taklla (Quechua/Day in the Life of the Inca) - The box containing this relic is at the top of the stairs mentioned above. 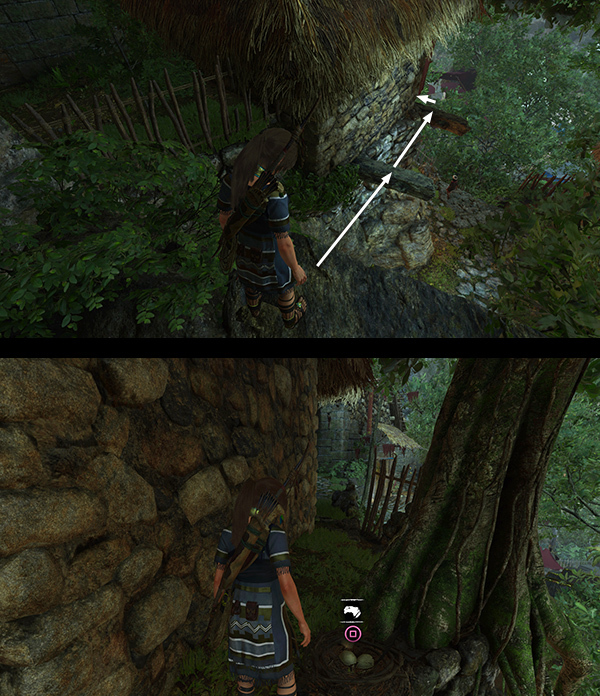 (screenshot) You can also reach it from the other side by climbing the stairs northeast of the wooden bridge across the river. 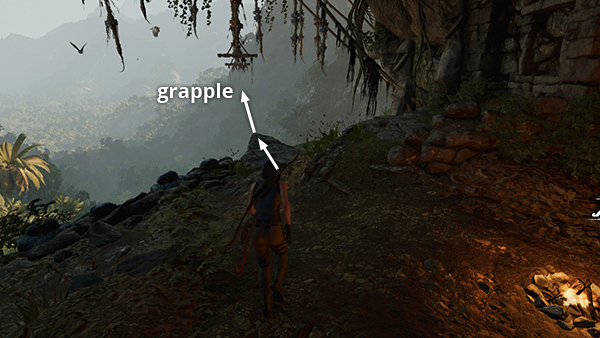 Referencing the in-game map, it's left of the middle of the zip line in that area. 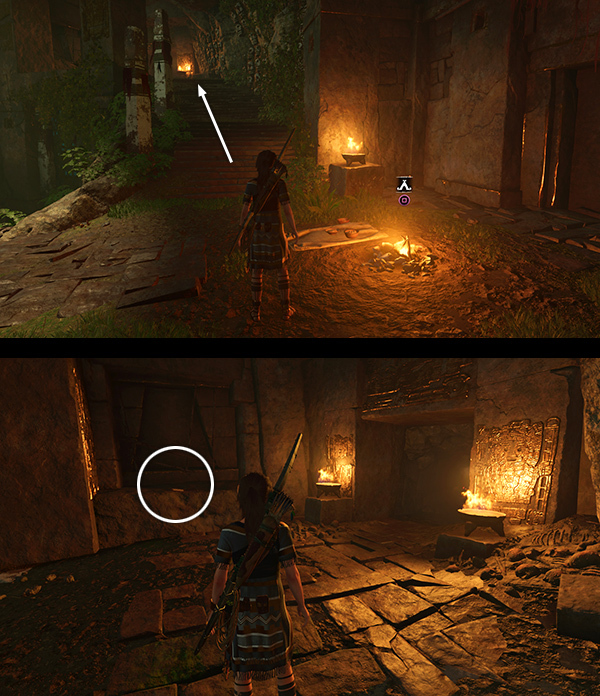 Inaccessible relics: There are a couple of relics revealed on your map early on that you can't reach yet. One looks like it's near survival cache #12. The other is in an unexplored area to the east. 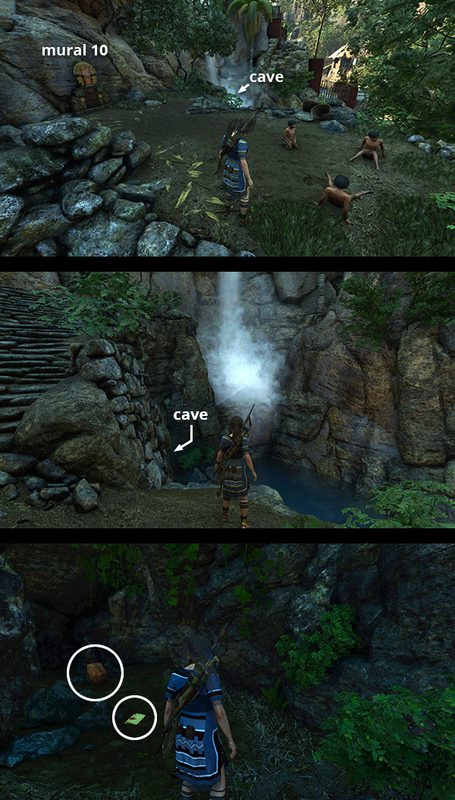 (screenshot) They will be covered in the REVISITING PAITITI walkthrough. 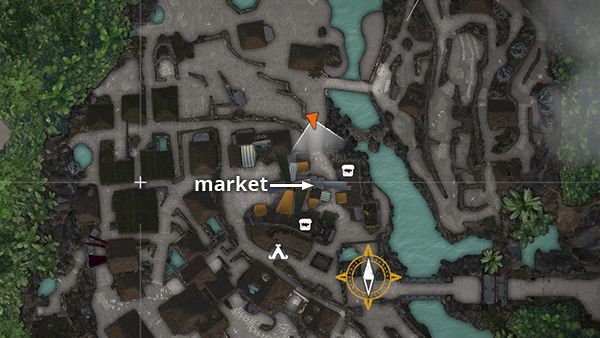 If you have purchased the REINFORCED KNIFE upgrade from one of the merchants in the MARKET, you can cut down the braided rope barrier on the west side of the area with the terraced pools to access a wooden platform above the river. This is one of several you'll need to dive off for the High Diving Challenge. (screenshot) Details below. 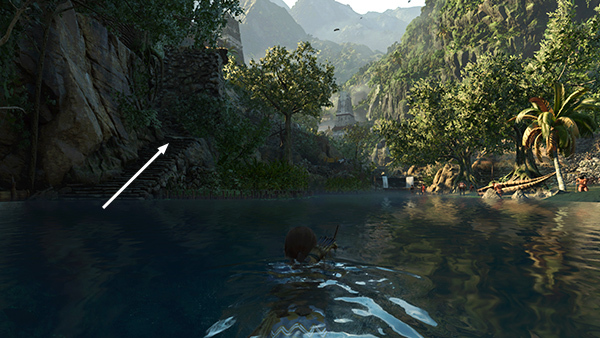 If you dive in now, you'll need to swim down the river to to the south and use the stairs on the left (screenshot) to get back to the area near Unuratu's home. 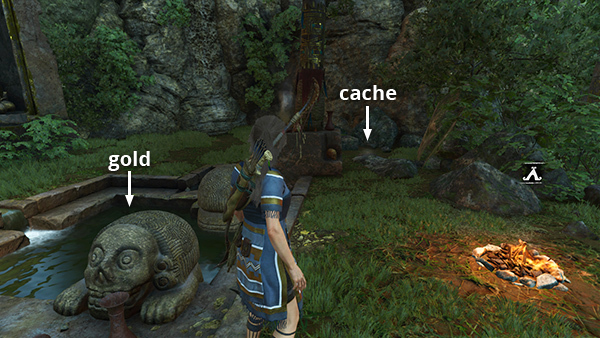 Survival cache (15/34) is buried just south of monolith #4. There's a man with a llama nearby. 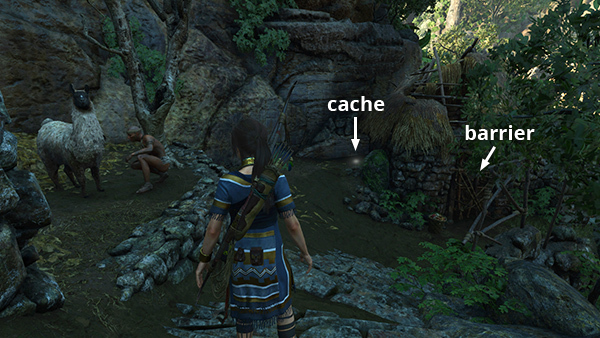 The cache is just to the left of the thatched hut with the braided rope barrier in the doorway. (screenshot). 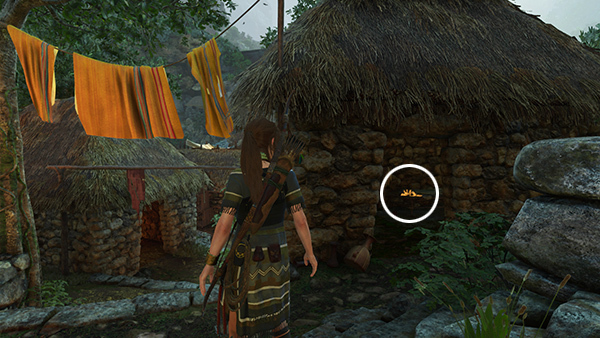 Relic (14/28) Ch'arki and Chuños (Quechua/Day in the Life of the Inca) - If you have the REINFORCED KNIFE upgrade, you can cut down the barrier and enter the hut mentioned in the previous entry. The relic is inside, along with some black powder and other resources. 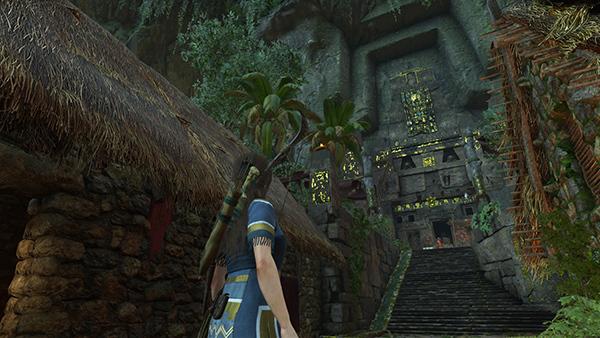 (screenshot) FYI: To learn more about Ch'arki and Inca cuisine, visit Tomb Raider Horizons. Survival cache (16/34) - When you examine backpack #3 this cache is revealed on your map. It's buried on the river bottom just below the cave where you found the pack. (screenshot) If you followed the list above, the others this pack would show have already been found. TEMPLE OF THE SUN CHALLENGE TOMB: The entrance to this tomb is in the Southwest corner of Paititi. There are two ways in: The more circuitous route takes you past mural #6, document #4, and relic #8. The more direct route is through a flooded passageway inside a nearby house. 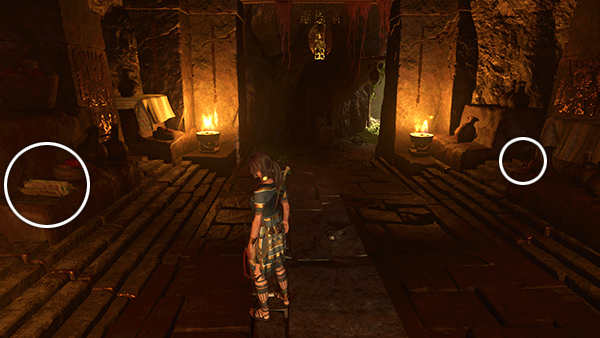 For details, see the separate TEMPLE OF THE SUN CHALLENGE TOMB WALKTHROUGH. 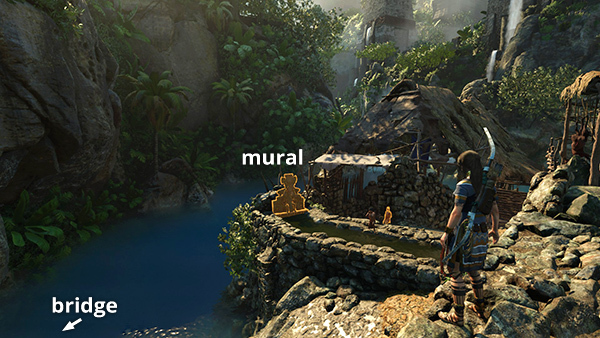 It includes the Temple Path Base Camp, the Temple of the Sun Base Camp, an archivist map (2/7), 3 murals (11-13/23), 5 documents (13-17/42), a survival cache (17/34), and one of the platforms for the High Diving Challenge. 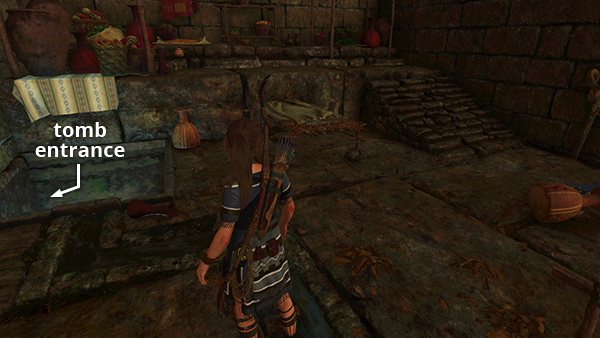 Examining the tomb stele unlocks the Seeker Skill Hoatzin's Hunger, which automatically increases the amount of natural crafting resources Lara obtains from each source. 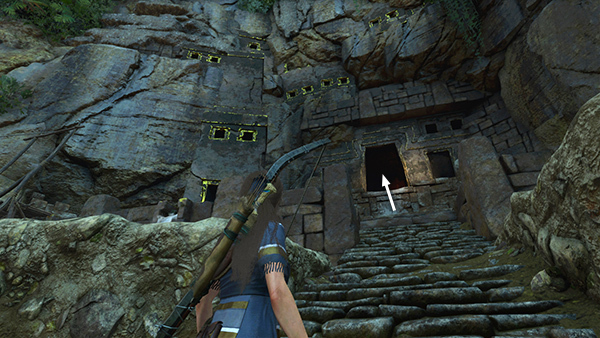 PATH OF BATTLE CHALLENGE TOMB: The way to this tomb is on the northwest side of the city. The map location is show in this screenshot. 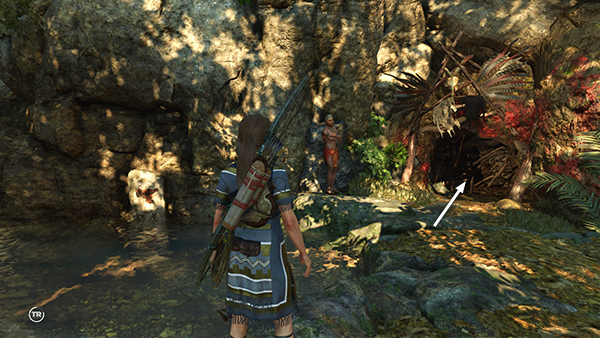 If you speak to man standing near the tunnel entrance, which is decorated with a jeweled skull, feathers, and red paint (screenshot), he'll tell Lara about the trials cultist warriors face on the Path of Battle. 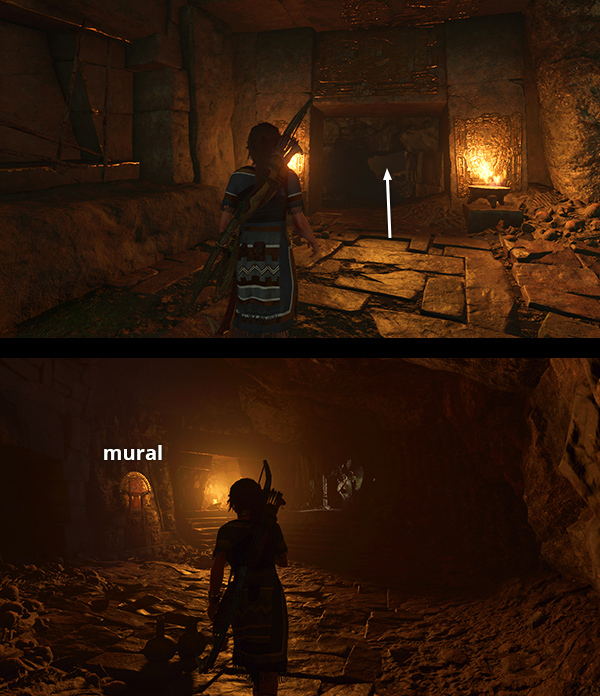 The tomb entrance is then marked on your map. You can explore this side area now, but to save backtracking, we'll combine it with part of the Hearts and Minds Side Mission during the HIDDEN CITY REVISIT walkthrough. ABANDONED VILLAGE (revisit): This is the isolated area in the jungle to the northwest of the city. 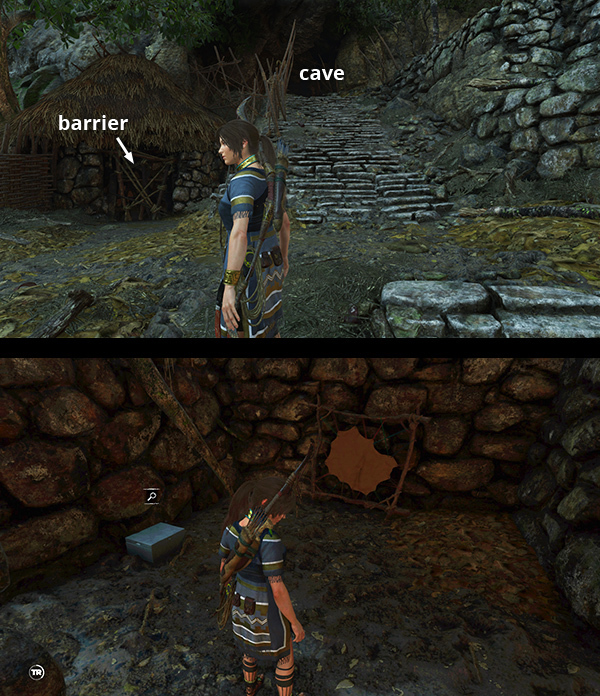 You passed through it briefly when you first entered Paititi and rescued Etzli from the cultists. At that time we didn't explore the whole area. Let's return there now to clean up. NOTE: Before setting out, you may want to visit the MARKET to sell some resources and free up space in your inventory, especially gold, jade, and hides. 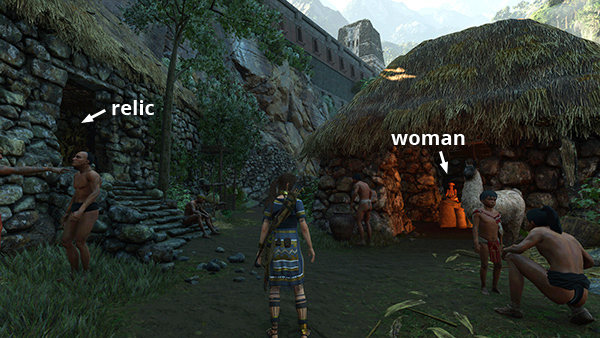 If you don't yet have the SATCHEL and REINFORCED KNIFE UPGRADE, try to get them now from the woman merchant. 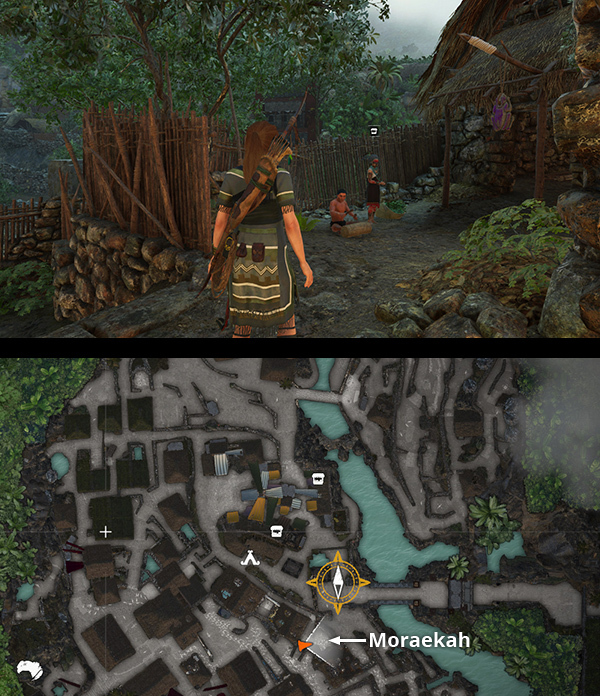 The ROPE ASCENDER, sold by the traveling merchant, Moraekah, will also come in handy. NOTE: The fight is very similar to the one in the wolf den in the Howling Caves Challenge Tomb in Kuwaq Yaku, so if you need additional help, such as with the dodge/evade mechanic and QTE button prompts, check out that section. Once you've defeated the wolf pack and the black alpha wolf, take their hides. Black wolf hide (a.k.a. "sparkle fur") is a rare resource, used for crafting outfits. So even if you don't have inventory space for regular hide, you can still get it. ABANDONED VILLAGE CRYPT – CHUKI, THE WEAVER: Follow this link for the ABANDONED VILLAGE CRYPT WALKTHROUGH, which includes a mural (14/24), 2 survival caches (20/34 and 21/34), a relic (15/28), an archivist map (4/7), and a sarcophagus containing an outfit component, Vestige: Manko's Boots, and 750 gold pieces. You'll also pass a condor's nest for the Keep Calm and Carrion Challenge and one of the diving platforms for the High Diving Challenge on the way. If you more or less follow this walkthrough, you should achieve fluency in the Yucatec Ancient Dialect around now. This will enable you to read the Fluent Yucatec monolith (5/7) in the Temple District. 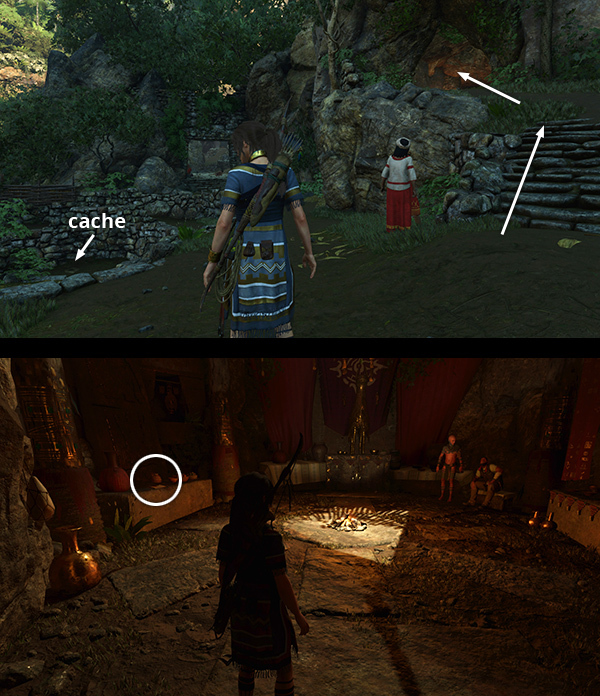 The clue leads to a survival cache (22/34) near the Proficient Yucatec Monolith (1/7). Follow this link for details and screenshots. When you're ready, meet Unuratu and Etzli outside the south entrance to the MARKET. (screenshots) Walk toward the crowd gathered near the southern bridge to trigger a cutscene. 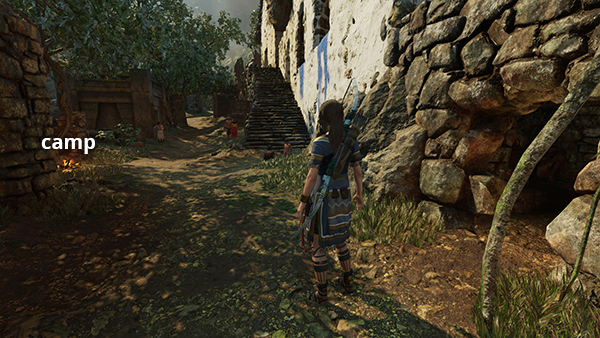 Lara joins Unuratu, Etzli, and Hakan near the waiting citizens as the cult leader is carried out from the upper city on a litter. 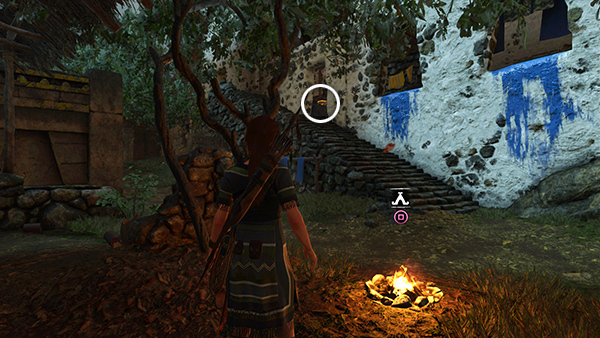 Despite his ornate mask, Lara immediately recognizes Dominguez. He holds the Key of Chak Chel aloft proclaiming it "the instrument of our unity and salvation." The queen explains that during a Cleansing, it is the duty of Paititi's leader to embody and sacrifice the god Kukulkan in order to save the world. Unuratu herself has prepared for this, but now Amaru, the cult leader and her late husband's brother, plans to take her place and complete the ritual, remaking the world according to his own design. Lara tells Unuratu that she's met this man and heard his message before. 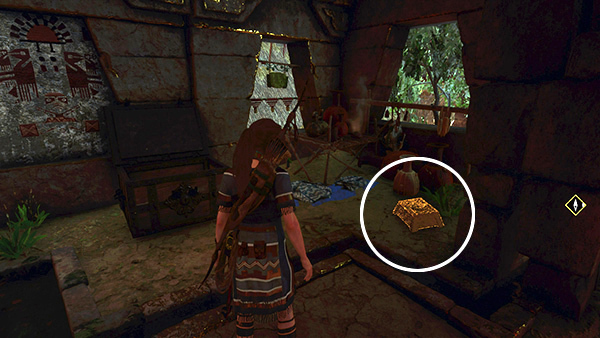 Lara and Unuratu agree that the best course of action is to find the Silver Box of Ix Chel before the cult discovers it then hope that Amaru can be convinced to do the right thing. As Amaru is carried on into the city, Hakan produces a knife and tries to attack him. Unuratu intervenes, urging Hakan to wait until the time is right. 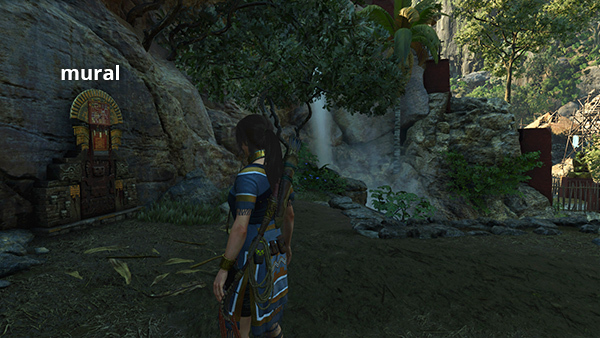 She sends Etzli to scout ahead, so he won't be drawn into the conflict, and urges Lara to follow. 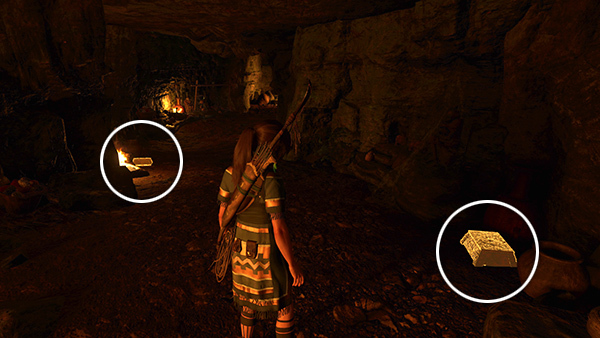 After the cutscene, a photograph, Amaru, is added to the Artifacts menu, in the Lara's Notebook Story. It shows Dominguez wearing his regalia as the leader of the Cult of Kukulkan. Examine it to learn more about Amaru/Dominguez's rise to power in both Trinity and Paititi. Lara contacts Jonah by walkie-talkie. He tells her he's made friends with Uchu and settled right in. Naturally. She tells him about Dominguez and her plan to head for the Eye of the Serpent to get the box before the next cataclysm hits. ENTERING THE TEMPLE: Etzli is waiting for you at the entrance to the temple, on the west side of the city, near the Temple District Base Camp. 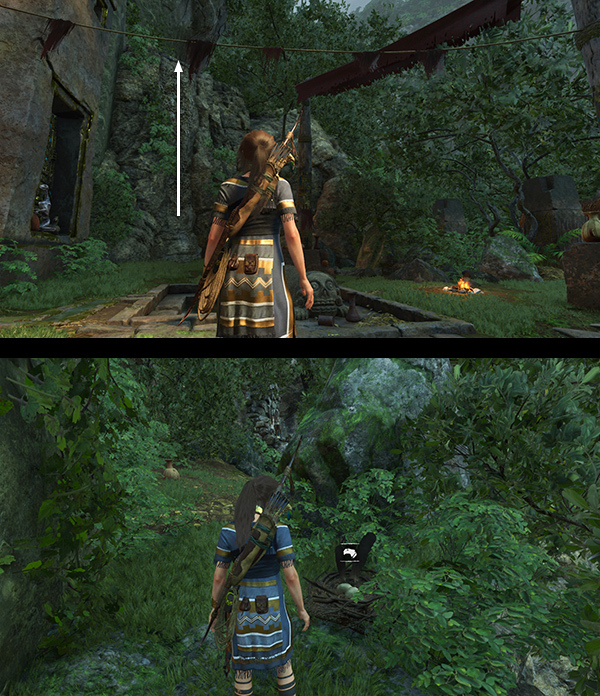 (screenshots) The boy shows Lara the entrance to the temple and tells her she'll know the area she seeks by the smell of death. He also warns her to watch out for the cult patrols. As you enter, you receive a large XP award for advancing the story. Just inside, on the left, is a document (21/42), Troubled Lands (Mam/Founding Paititi), and on the right some gold ore. (screenshot) Continue into the next room to find a relic (16/28) Macuahuitl (Cult of Kukulkan) in a box on the far side of the room (screenshot), as well as a container of supplies in the far left corner. DEEPER INTO THE CAVERNS: Follow the hallway to a deep chasm. Use the horizontal bar to swing over to the climbing wall. Rappel down, swing back and forth, and jump onto the ledge ahead. (screenshots) Pick some mushrooms. 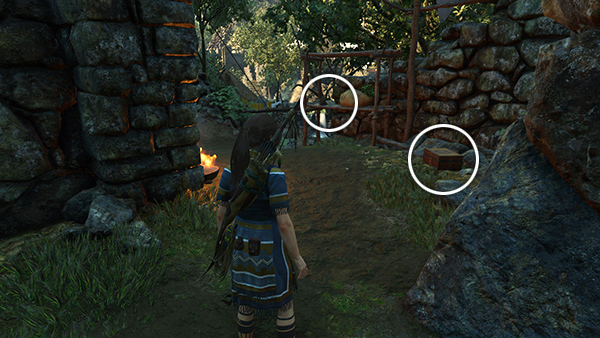 Then drop down to the lower ledge and loot a resource container. From there, grapple-swing across the cavern to the broad ledge to the northwest, where you'll find more mushrooms and the Belly of the Serpent Base Camp. (screenshot) Rest at the camp if you like. 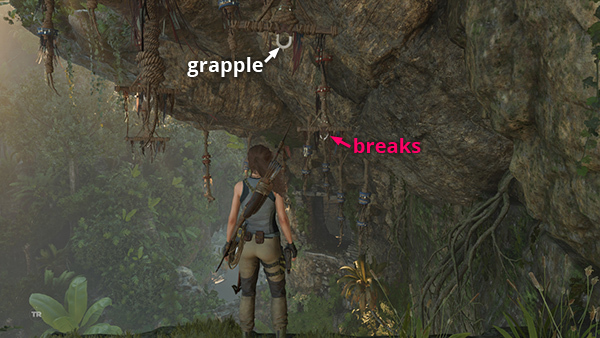 Then, if you've purchased the REINFORCED KNIFE UPGRADE, cut down the braided rope barrier near the campfire and drop down into a little room with still more mushrooms and 2 piles of jade. Climb out of this room then continue up the stairs to find another document (22/42), Trinity Arrives (Subjugating Paititi), sitting on a ledge at the top. (screenshots) Continue through the low tunnel to the west. When you emerge on the other side, there's a mural (15/23), Unuratu's Uprising (Quechua/Rebellion of Paititi) on the left. (screenshots) Examine it, then proceed through the narrow passageway into the foul-smelling area Etzli described, the BELLY OF THE SERPENT. 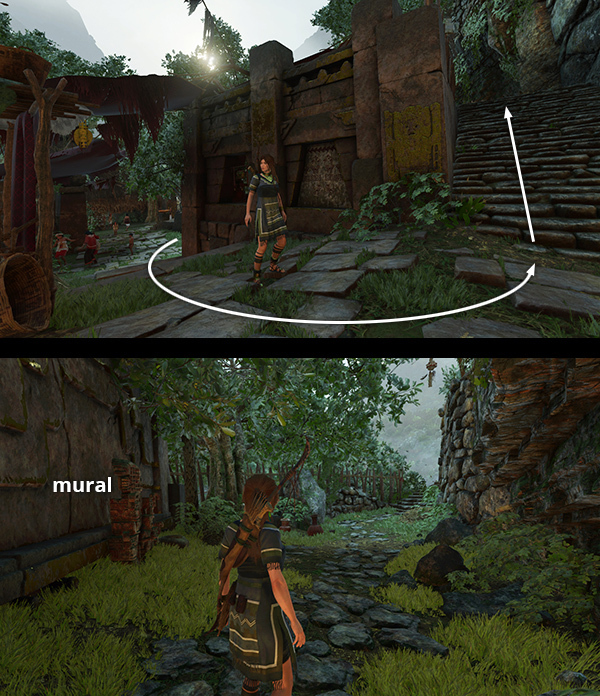 NOTE: Follow this link for the separate BELLY OF THE SERPENT and HEAD OF THE SERPENT WALKTHROUGH. After you complete the areas BELLY OF THE SERPENT and HEAD OF THE SERPENT, you return to the LOWER CITY. This section is included below the CHALLENGES. HIGH DIVING CHALLENGE: There are at least 6 diving platforms in and around the city. You only need to dive off 4 of them to complete the High Diving Challenge. 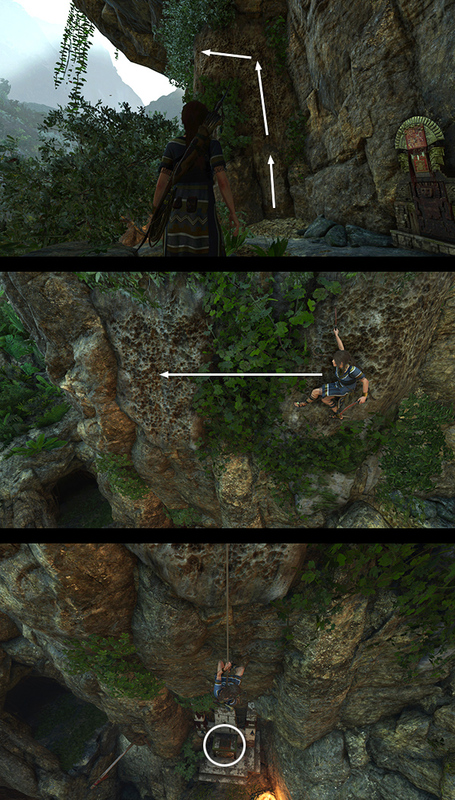 You may have already done the first high dive off the platform where you enter Paititi from the Trial of the Eagle. If not, no worries. There are several more opportunities. 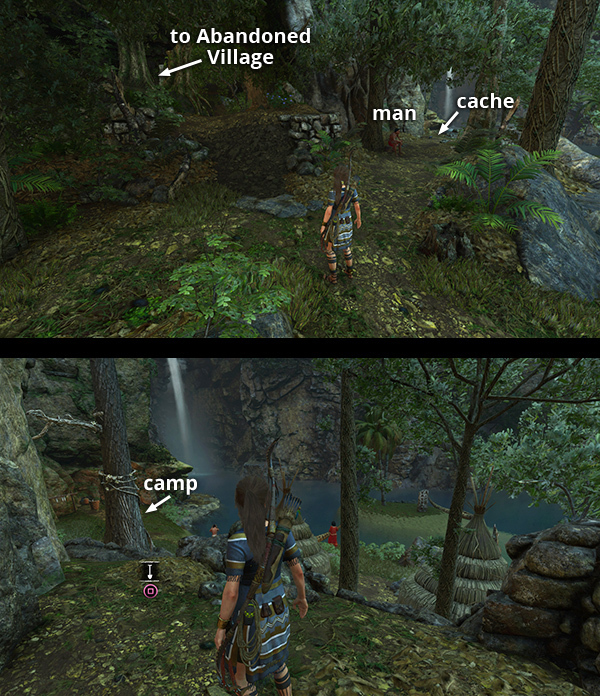 The platforms are marked with red dots on the annotated level map and mentioned in the relevant sections of the walkthrough. This page includes a roundup with screenshots. CHANGING THE WEATHER CHALLENGE: There are 5 purple frog totems hanging around the southwest part of the city. 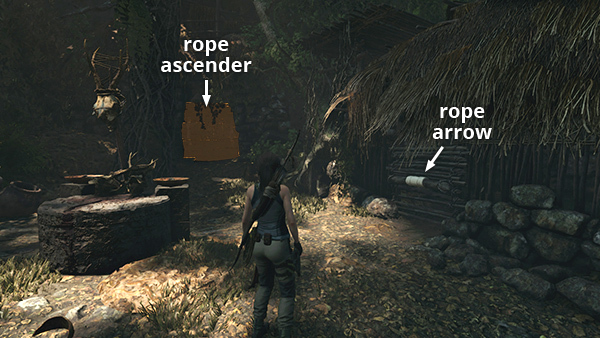 Lara can't use her weapons here, but you can target the rope coils holding up the totems to pull them down in order to complete the Challenge: Changing the Weather. 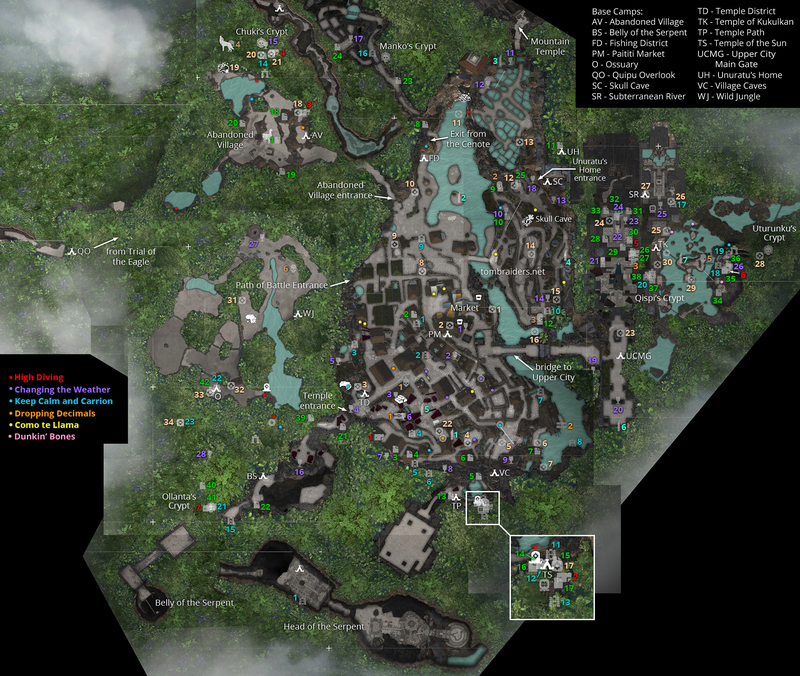 For the locations of all 5 frogs, check the map and this page with screenshots. DROPPING DECIMALS CHALLENGE: As you explore the west side of the city, keep an eye out for hanging quipus, similar to the ones you used to swing across the canyon when you first entered the Hidden City. Grapple-swing on 4 quipus to pull them down for the Challenge: Dropping Decimals. 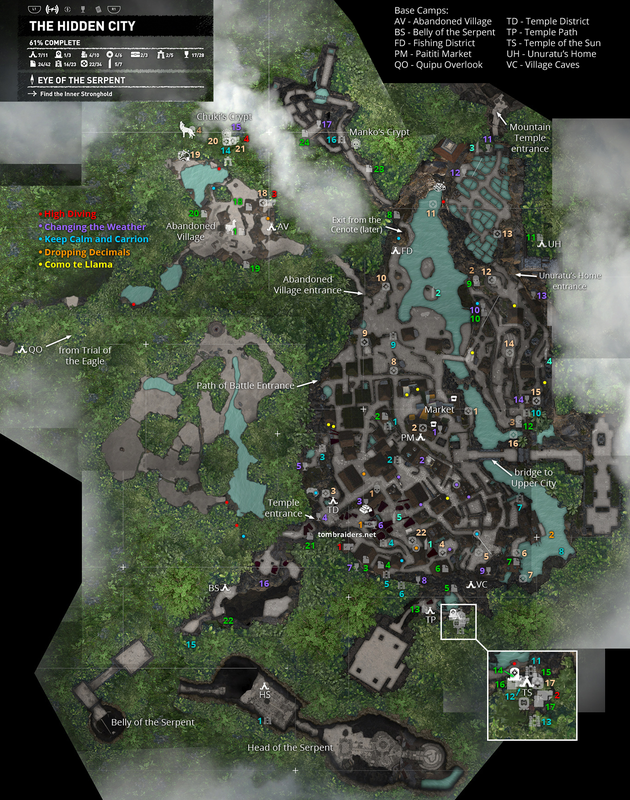 Check the map and screenshots for details. KEEP CALM AND CARRION CHALLENGE: As you explore Paititi you'll come across a number of condor's nests. Loot 3 nests to complete the Keep Calm and Carrion Challenge. 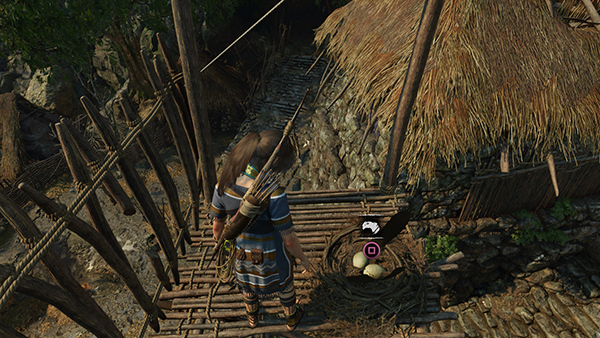 Condor nests look a lot like regular birds' nests, but they are marked with a special condor head icon. (screenshot) The feathers are also more rare and so more valuable. Even after completing the challenge, you can collect more feathers to sell and use for crafting outfits. I have not included a separate page for this challenge, but several nests are mentioned in the bulleted lists above, and marked with blue dots on the annotated level map. 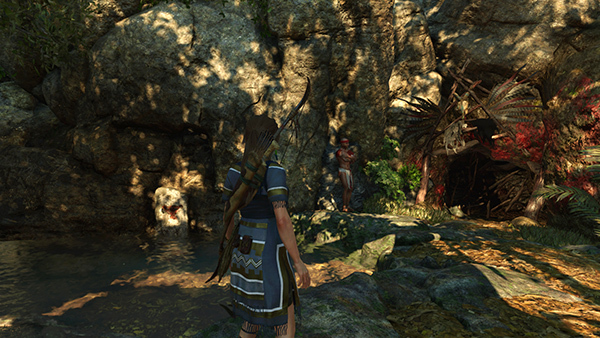 When you return to Paititi after the BELLY OF THE SERPENT and HEAD OF THE SERPENT levels, Etzli is captured and Lara must outrun a group of cultists. 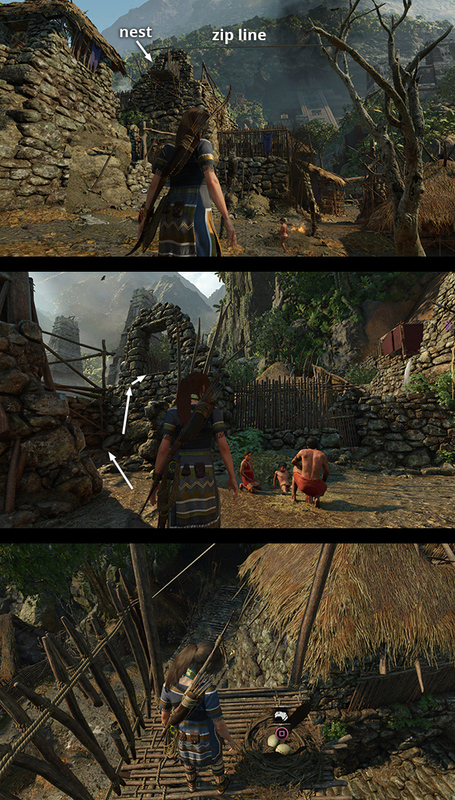 Don't bother trying to fight, and don't hesitate too long in any area or Lara will be cornered and killed. You probably didn't have time to notice or care, but upon your return to the city, a Silver Statuette, the serpent-shaped key, was added to your Artifacts collection in the Path of the Stars Story. NOTE: There's no need to avoid the cult members stationed around the city. They won't attack, but you still won't be able to enter the upper city, at the end of the southern bridge. When you reach Unuratu's home on the upper east side of the city, Lara tells her what's happened. 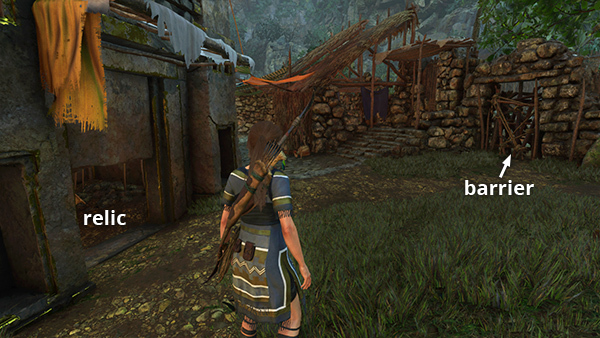 Unuratu examines the silver key Lara found and suggests that it belongs to the Mountain Temple, near where the cult is holding Etzli. After a bit of strategizing, they agree that Unuratu will attempt to rescue her son while Lara goes after the Box. 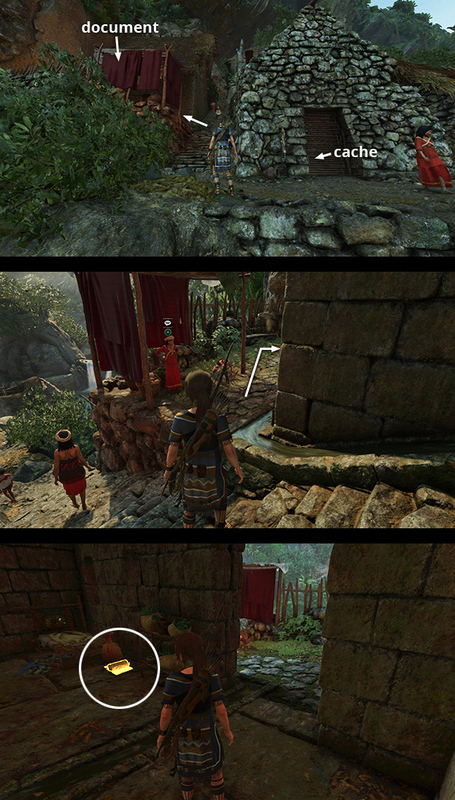 Once again, you can choose to follow the story or take a detour to do Uchu's mission. The situation with Etzli seems dire, but since it's just a game after all, the boy will be fine if you ignore him for a while. 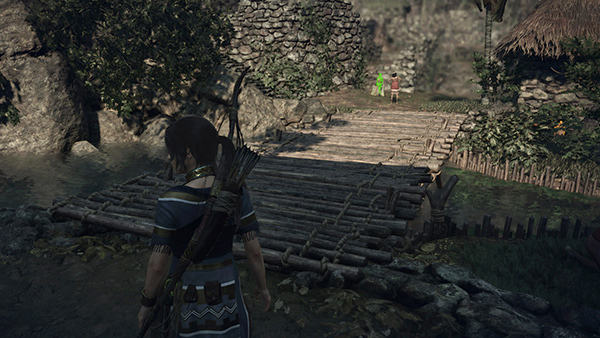 SIDE MISSIONS 3 & 4 – HEARTS AND MINDS: Uchu and Jonah are standing near the Unuratu's Home Base Camp. 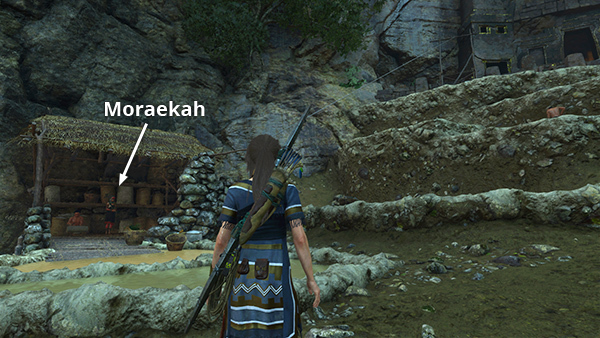 If you speak with Uchu now, he'll ask you to undertake a Side Mission: Retrieve the King's Horn. If you complete that task, he'll ask you to do a second, related mission: Retrieve the Savior's Amulet. 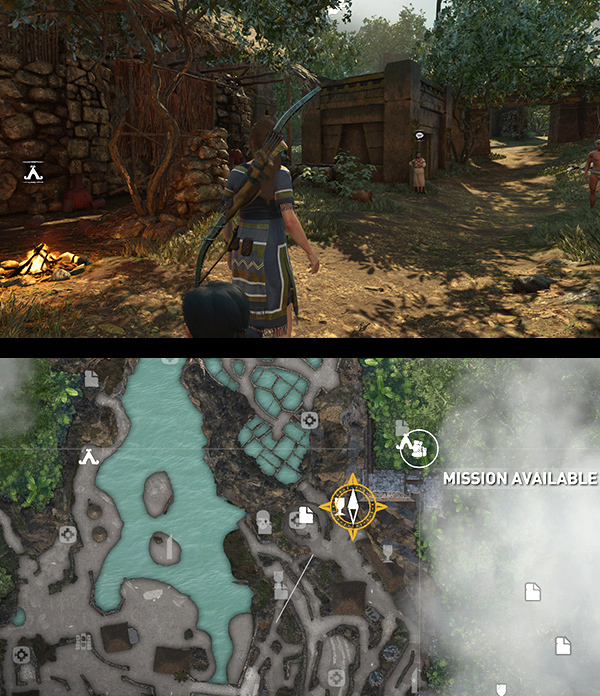 Details are included on two separate pages MISSION 3: RETRIEVE THE KING'S HORN and MISSION 4: RETRIEVE THE SAVIOR'S AMULET. Accepting the second mission will enable you to explore PAITITI'S SECOND CRYPT, where you'll find 2 documents (23/42 and 24/42), a relic (17/28), a mural (16/23), and a sarcophagus containing an Artifact, The Savior's Amulet plus 750 gold pieces. (This crypt does not count toward the Speak of the Dead Challenge.) Uchu will also give you 700 gold pieces, 350 after completing each mission. 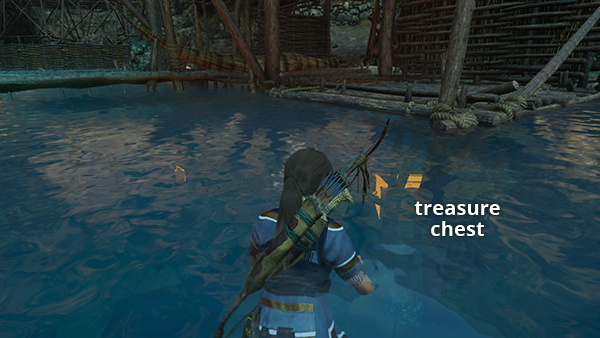 Returning to Uchu with the Savior's Amulet also unlocks the Hearts and Minds Achievement/Trophy. If you don't want to do these missions now, you can avoid Uchu or accept the mission and wait until later to complete it. The third Hearts and Minds Mission, Retrieve the Champion's Bow, is only available later in the game. 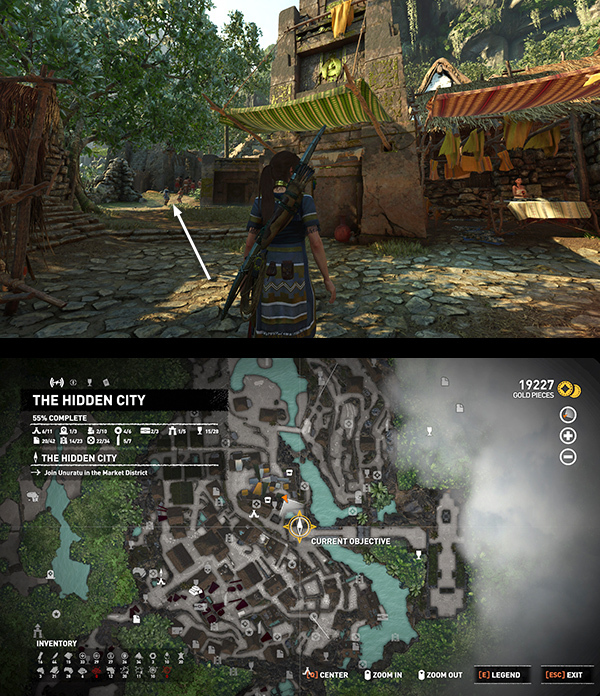 It is covered in the HIDDEN CITY REVISIT walkthrough. MOUNTAIN TEMPLE ENTRANCE: There's a base camp early in the next level, but before heading to the temple entrance, you may want to spend any Skill Points you've accumulated, buy and sell items, upgrade your weapons, and possibly change outfits. 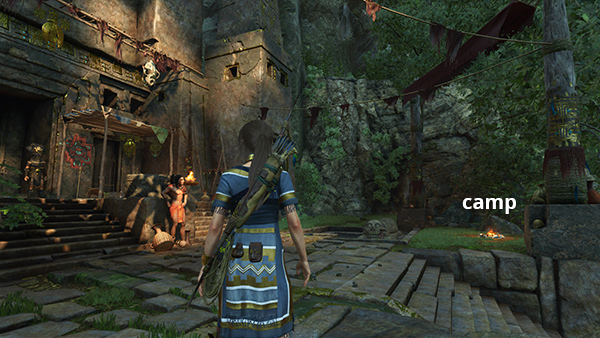 There are still some outfits Lara can't equip within Paititi, but you can choose from among the other outfits you've found and purchased. 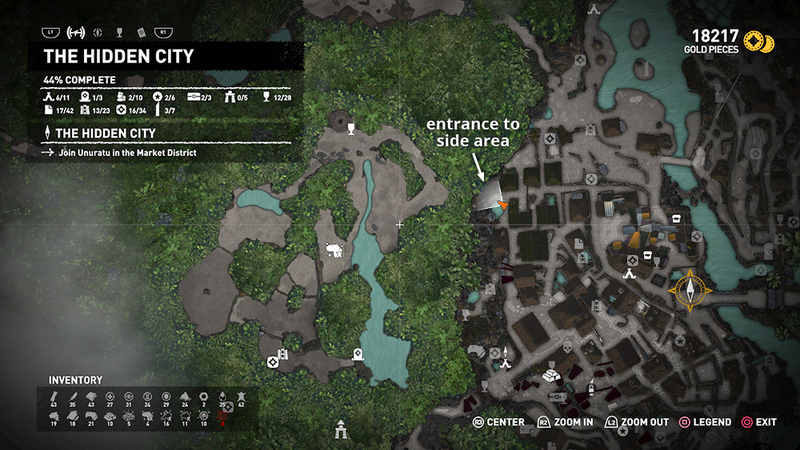 You'll be heading into a few combat-heavy sections, and you won't return to Paititi for a little while. REVISITING THIS LEVEL LATER IN THE GAME: When you leave for THE MOUNTAIN TEMPLE, you will only have completed about half of the HIDDEN CITY. You will return here soon and unlock some previously unreachable areas. †UPDATE HISTORY: 10/14/18 - First draft of walkthrough posted online. Made a few minor tweaks later the same day. 10/18/18 - Added labels for first four challenges and llama locations to the annotated level map. 10/29/18 - Added Puma's Feint skill suggestion. 11/11/18 - Attempted to clarify the numbering of the side missions. 12/2/18 - Added note about Manko's Crypt not counting toward the Speak of the Dead Challenge. 12/8/18 - Added gold awarded for completing each side mission. 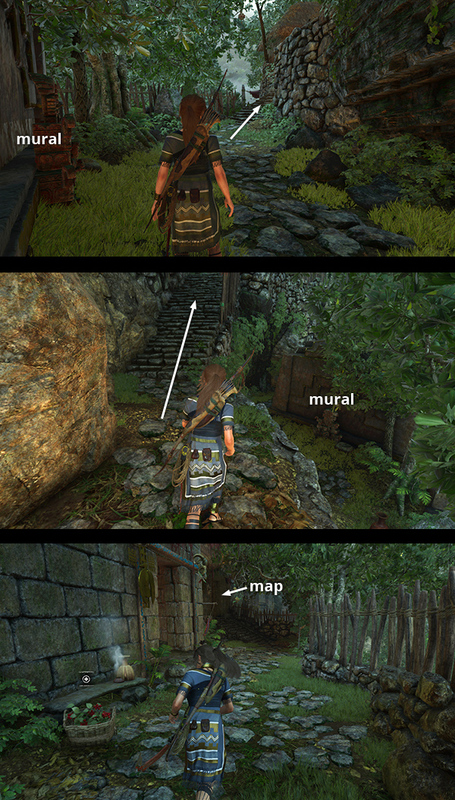 12/20/18 - Added screenshot and map marker for the exit from the Cenote level, near the Fishing District base camp. 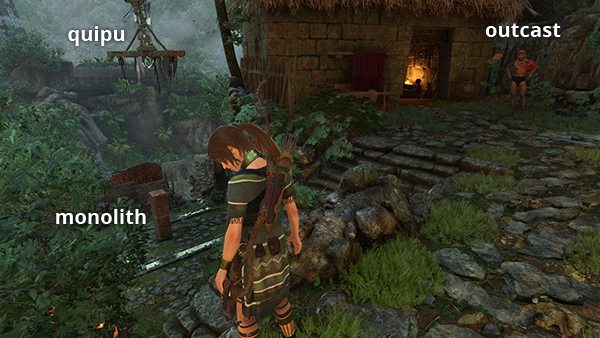 1/9/19 - Added note about The Forge DLC and info about the Hearts and Minds Achievement/Trophy. 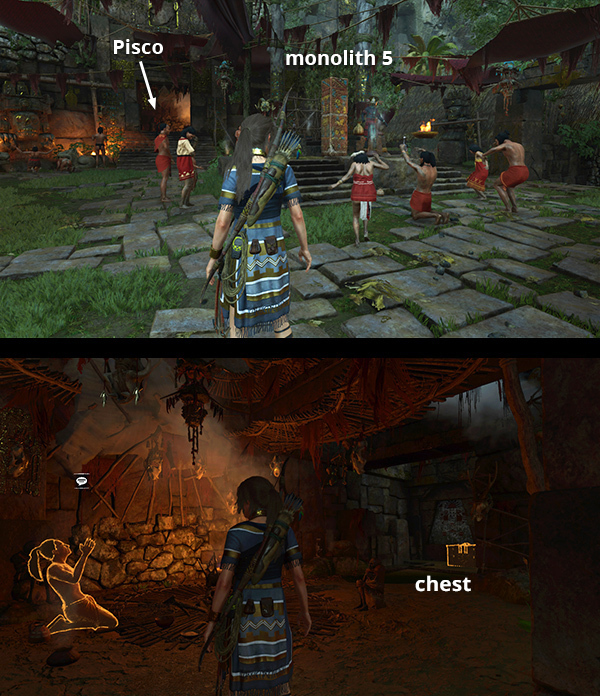 3/13/19 - Added language proficiency needed to decipher monoliths #3 and #4, thanks to Stu40000.